Sunset quotes and photos are known to inspire travel, productivity, hope and happiness. Who doesn’t love a beautiful sunset? There’s just something about sitting on a cliff with a glass of wine and watching as the golden orb of the sun falls beneath the horizon. It’s a magical moment that we all would love to cherish more often, but many of us never take the time to watch sunset. 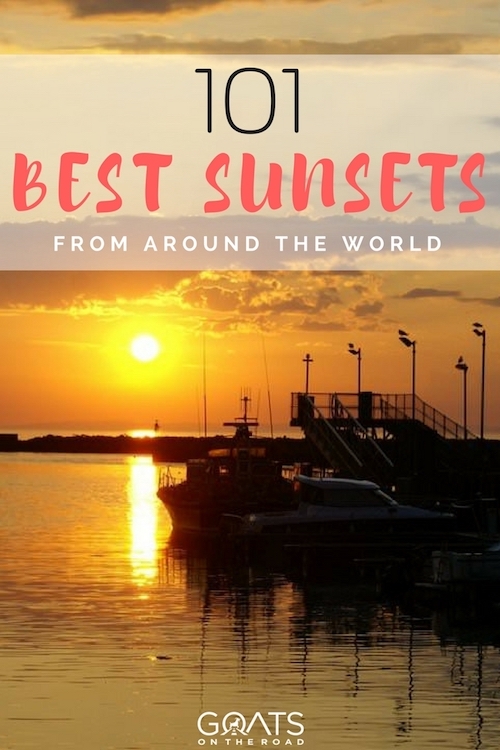 In this post I’m going to list the best sunset quotes, and then show you a series of the best sunsets in the world that we’ve taken while travelling full-time over the past 10 years. 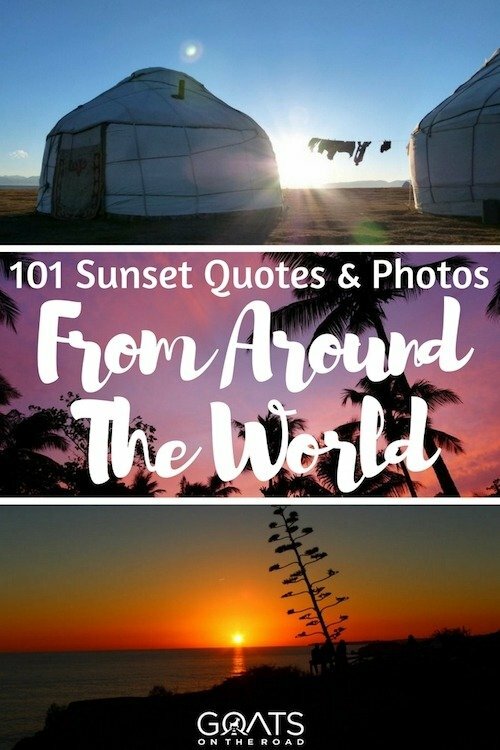 Here are a series of the best sunset quotes we could find online. There are sunset quotes that relate to people, to love and life and to every aspect of this world. I’ve included one of our best sunset photos alongside each sunset quote, as well as a description of the photo itself. Where Did We Find These Sunset Quotes? We scoured the internet for all of the best sunset quotes, and then we searched through all of our sunset photos from 10 years on the road. In this post, we’ve matched some of our favourite sunset photos with our favourite sunset quotes! What Makes a Good Sunset Quote? We think that the best sunset quotes inspire you to actually go out and watch a sunset. They can also inspire something deep inside that reminds us how wonderful this world we live in can be. Sometimes a sunset is so perfect, that it seems as if the skies are painting a picture just for you. 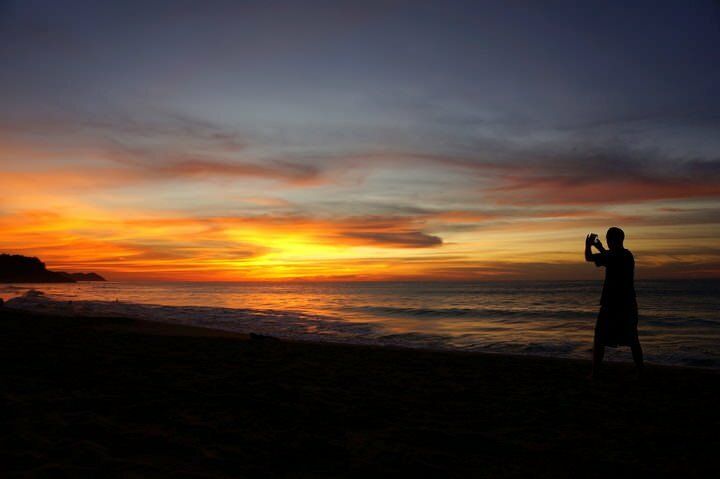 To take a good sunset photo, you need the perfect exposure. You should make sure your lens is clean and ideally, you should use a tripod. It’s a good idea to shoot in RAW format for post-production and sunsets often look better when you shoot in wide, and then zoom in. Put your camera in Aperture Priority mode (usually an A on the settings dial), and set it to a high number. Keep the ISO as low as possible (usually 100 – 200) and watch the shutter speed. Sometimes bracketed exposures can help with getting the perfect colors and lightness in a sunset photo. This setting can be an auto HDR, but its best to do it manually in post-production. Lastly, when taking sunset photos it’s important to be patient. Oftentimes the best sunset photos are taken after the sun has disappeared. Sunset photographers have all had this happen to them. They start packing up their gear and suddenly the sky lights up in brilliant oranges and reds, forcing them to rush to get set up again. Take your time and never pack up your gear until the sky is dark! 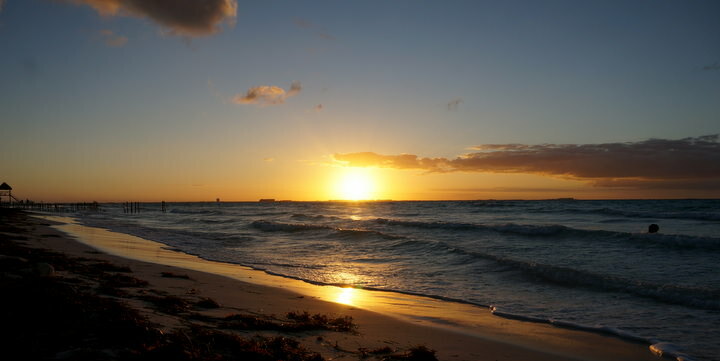 Now let’s get started with all of our best sunset pictures and our best quotes about sunset. 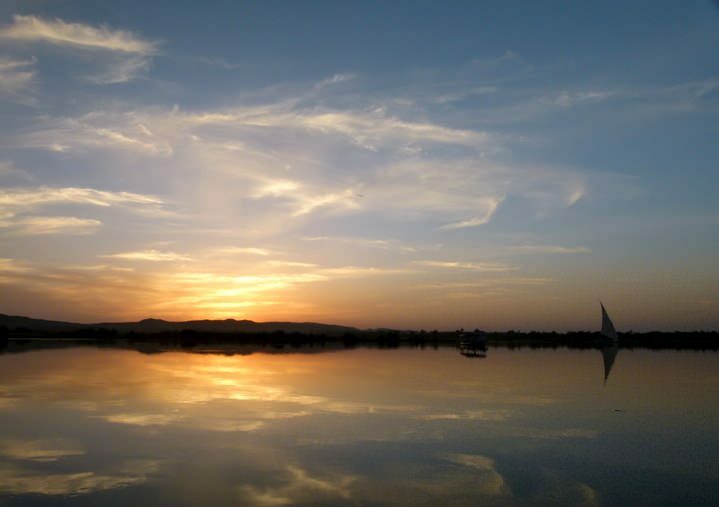 This photo was taken during our felucca sailboat journey down the Nile River in Egypt. The sunsets reflecting off of the glass-like waters were fantastic! 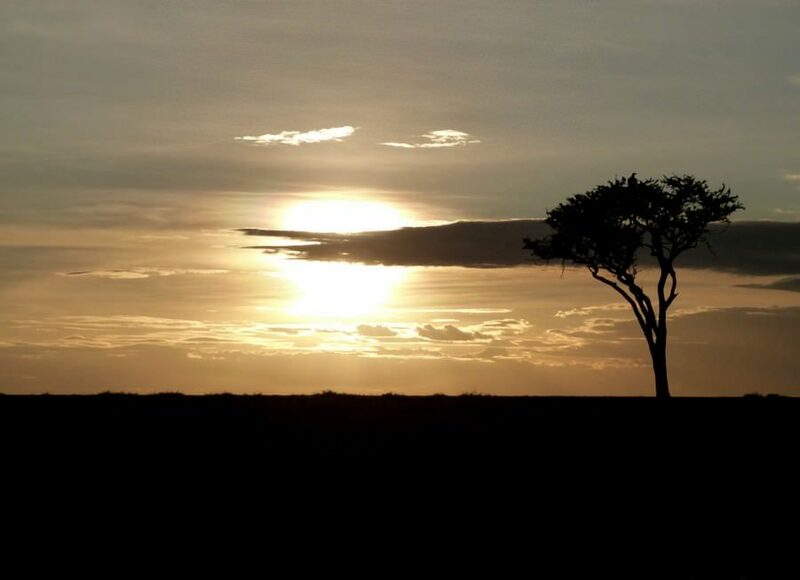 This stunning sunset is from our safari in the Masai Mara, Kenya. We were out spotting animals until the evening and were able to capture some photos of a sunset as well. This was one of the best sun-downers we’ve ever had! 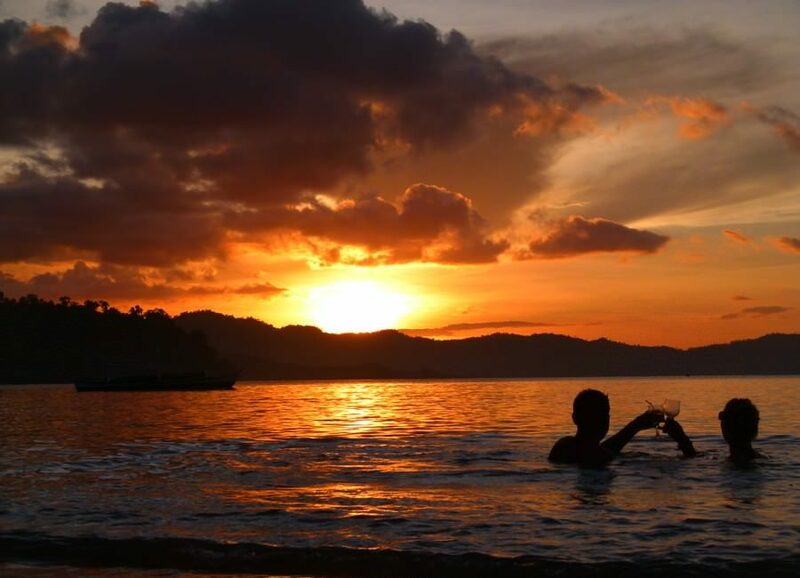 Sitting in the warm water, enjoying a drink and watching the sun set from one of the Philippines best beaches made for the perfect end to a perfect day. Witnessing the sun set over these beautiful, ancient temples in Bagan, Myanmar was an awesome experience. We climbed up to the top of a temple for this stunning view. 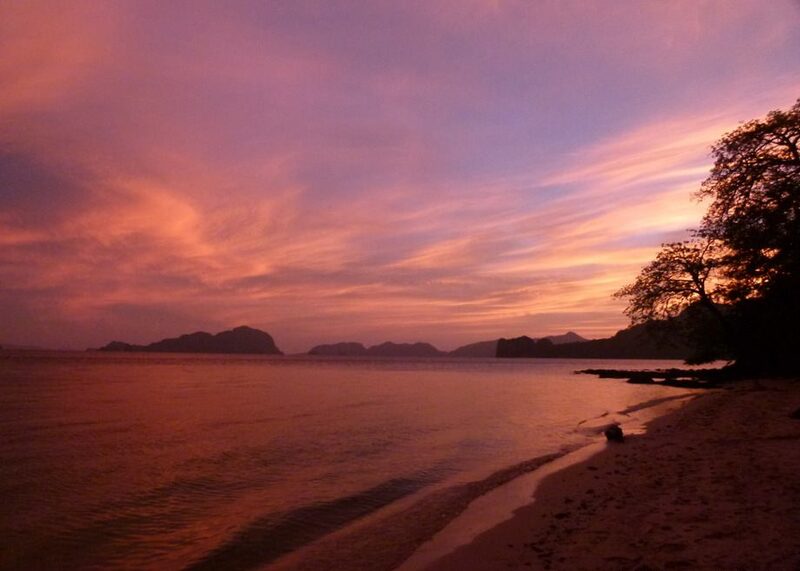 El Nido has some stunning sunsets. During our 8 days there we were able to get some excellent shots! Enjoying dinner on the beach while looking out at this view, is there anything better? Watching the local children playing in the water as the sun was setting in Cape Maclear, Malawi was a true joy. Seeing the happiness on their faces while they splashed around is something we’ll never forget. This is the perfect silhouette! Although we had some ups and downs during our 3 weeks of travel in Malawi, one thing that was always an “up” were the sunsets from Lake Malawi. Each night we would walk the shoreline and enjoy the reds and oranges sparkling off of the lake. All of the local people were out by the lakeside doing chores and the children were always playing. Truly a joyous part of the day. Fez, Morocco is a city with loads of character, charm and history. This was the view from our guesthouse there. What a gorgeous sunset! We called Koh Phangan “home” for a month during our travels. We couldn’t get enough of this island! The beaches are stunning, the food is great and there’s so much to see and do. This is a beautiful sunset from our hut on Leela Beach. 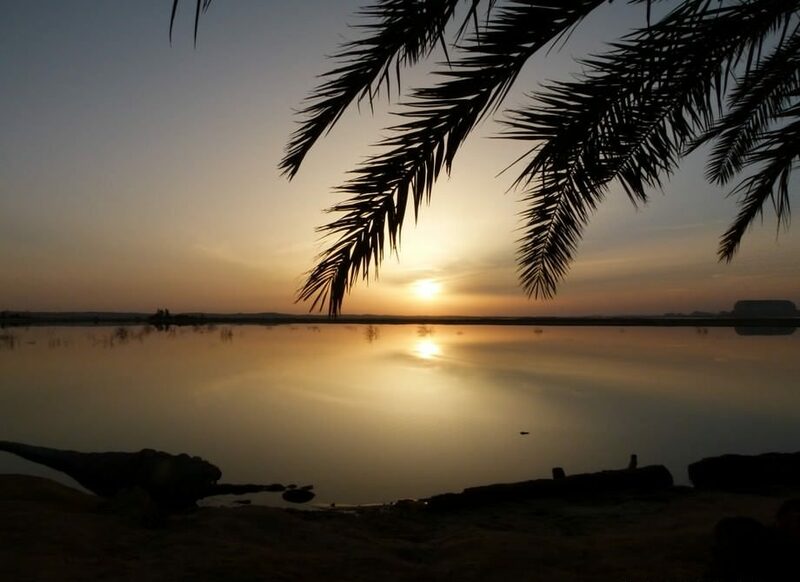 Siwa Oasis is truly that, an oasis away from the hustle and bustle of the Egyptian cities. Watching the sun set over this body of water while enjoying some dinner and some sheesha pipe is the perfect end to the day. Zanzibar is a fascinating island. From beautiful white sand beaches to amazing Arab architecture, Zanzibar has it all. 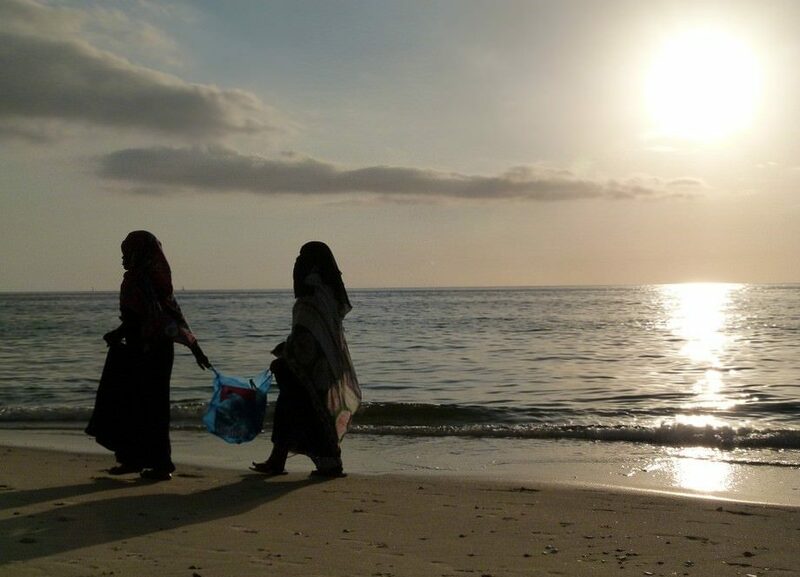 This is a photo of two women wandering the beach at Stone Town. Tbilisi is a fascinating city with loads of history and culture. We spent about a week here and loved it. 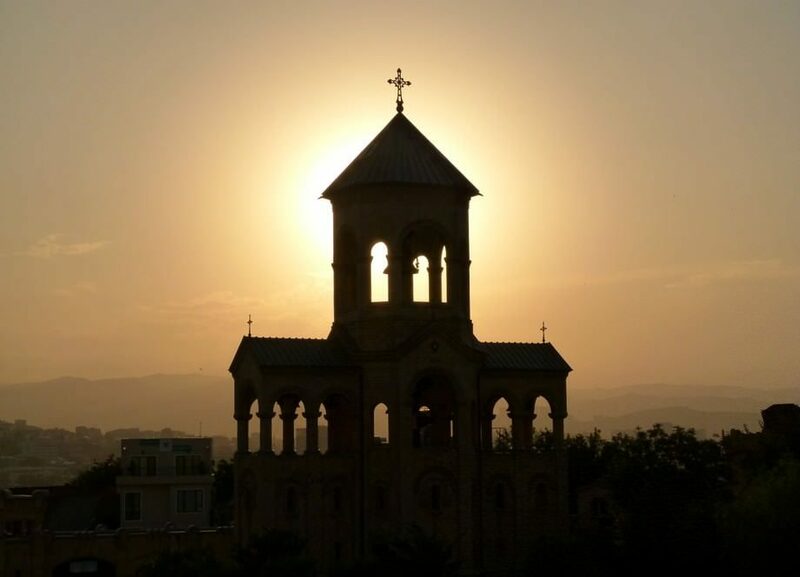 There are many churches in Tbilisi and we were lucky to catch this great sunset on camera. Ah, Mozambique! We spent a wonderful month in this country and sailed through the Quirimbas Archipelago. Rolas Island was one of the islands we spent the night on, just us under a mosquito net on the beach…stunning! 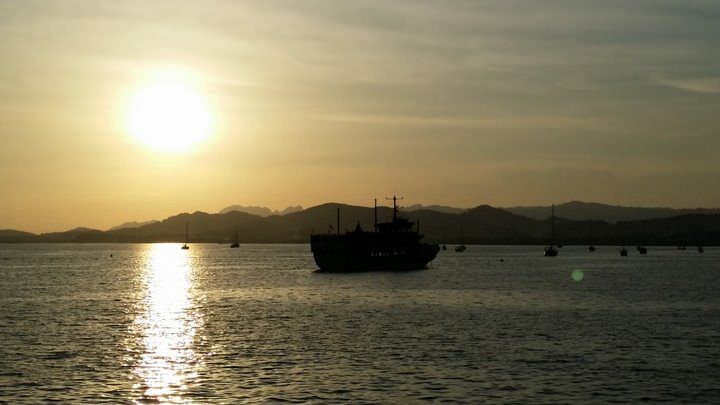 We spent about a week on the island of Langkawi in Malaysia and with sunsets like this one, it was hard to say goodbye. We were lucky to see a few amazing sunsets during our week-long stay in Tbilisi, Georgia. 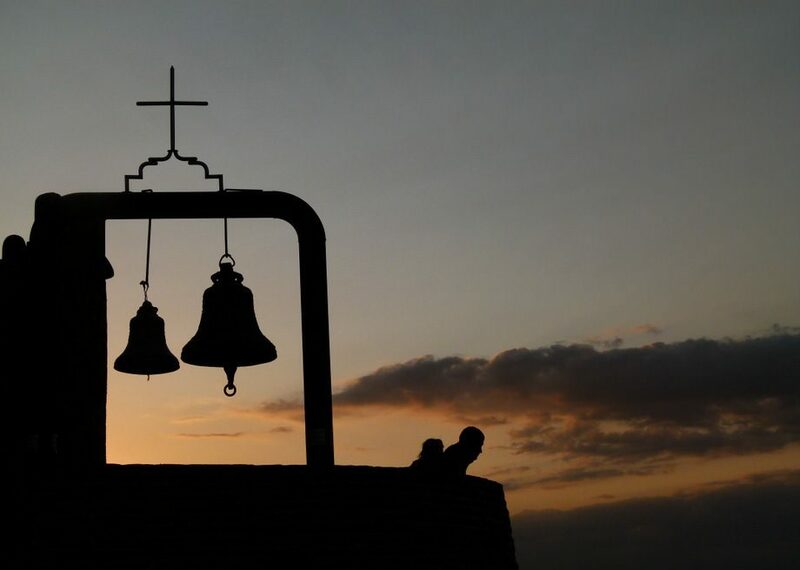 Church bells are seen all over the city and made for a perfect background to our photo. Liking These Sunset Quotes? 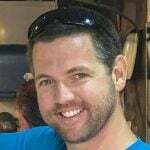 Share The Post! After a very enjoyable 5 weeks of driving through South Africa, we decided to pop into the tiny country of Swaziland. We’re sure glad we did! 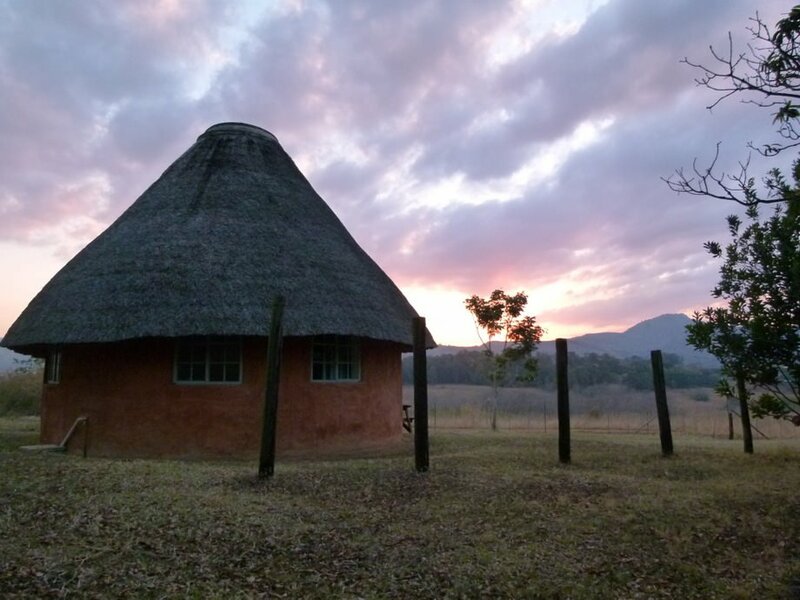 We spent about 5 nights at the Mlilwane Reserve and woke up to warthogs, wildebeest and antelope on our doorstep. The sun setting over our rondavel hut was icing on the cake. 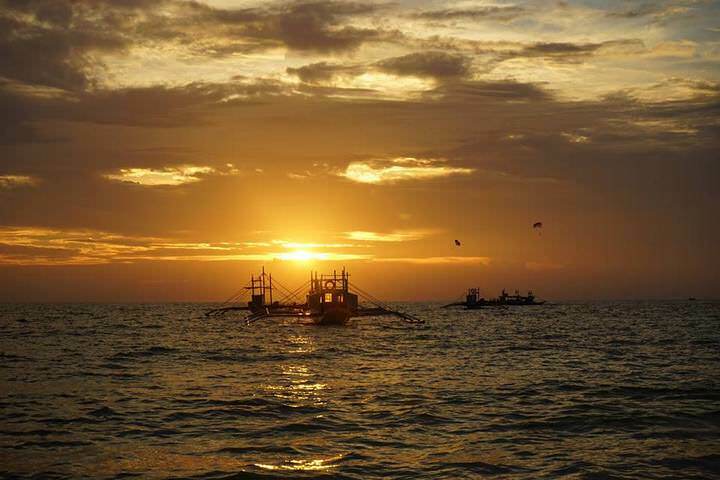 Some of the best sunsets we’ve seen have come from the Philippines! We spent about 5 days in Port Barton enjoying lazy evenings and gorgeous views like this one. Although there are numerous Palawan resorts, we chose to stay in a bungalow and had a great time. Inle Lake is a great place to relax and unwind. Renting a bicycle and exploring all that this area has to offer is a must. Make sure to head up to the winery for awesome sunsets. Istanbul is a very lively city! With so much to see and do here, you could spend months. A highlight is walking over to the Bosphorus Bridge for sunset and a beer. Santorini is known to have some of the most beautiful sunsets in the world. 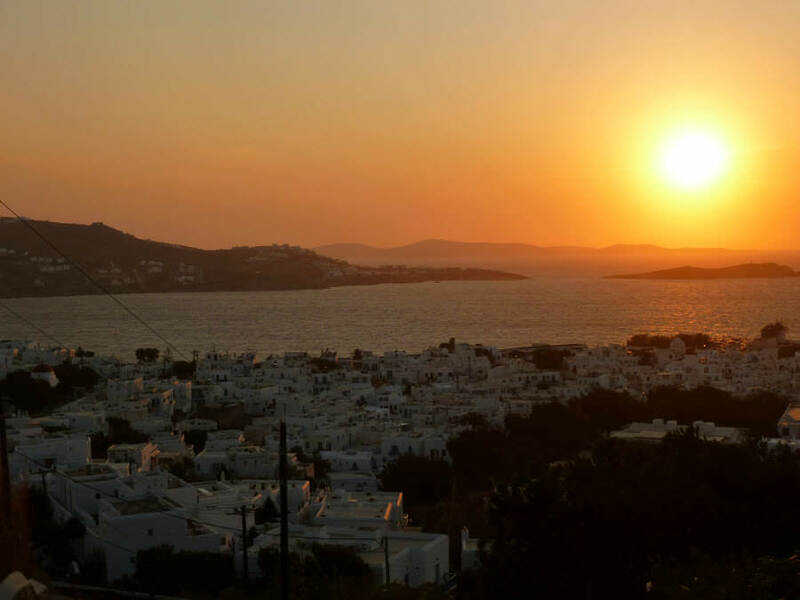 You almost don’t need a sunset quote to explain how stunning the skies are on this tiny Greek island. 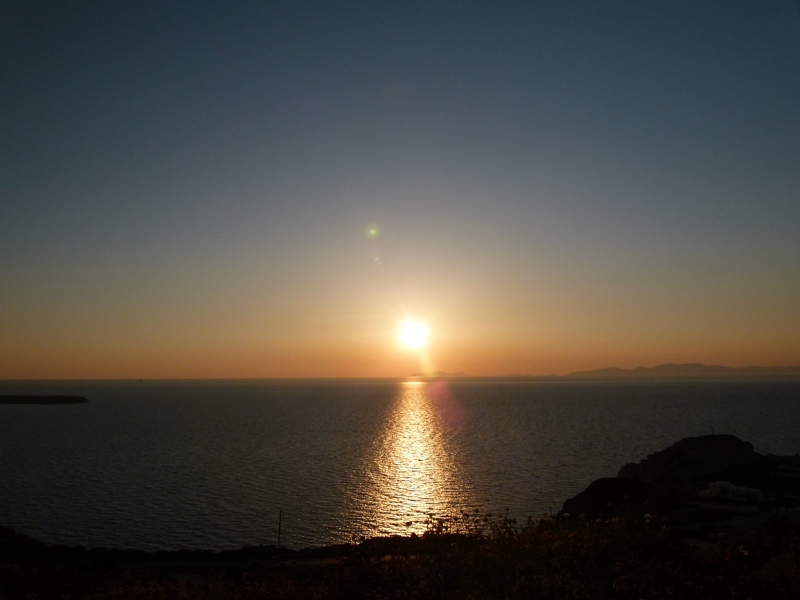 This sunset photo was taken from the cliffs near the famous whitewashed town of Oia (pronounced ee-ya). 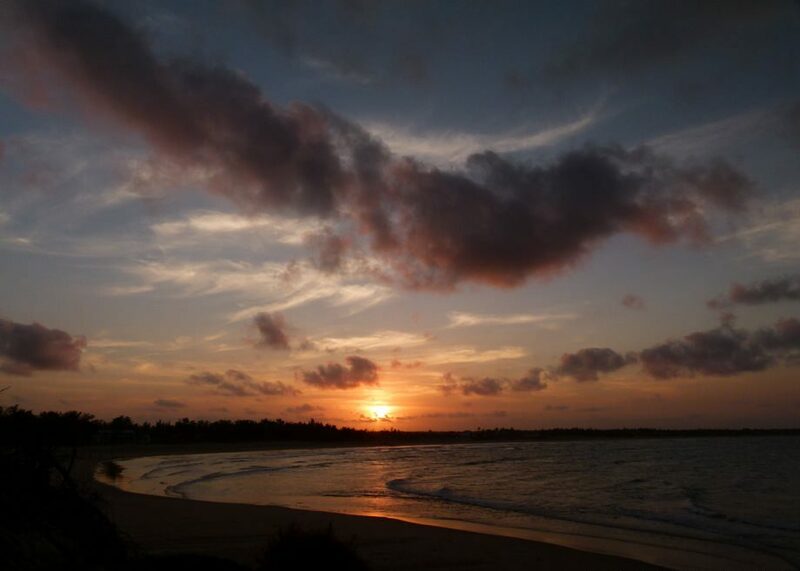 We seem to have a lot of gorgeous sunsets from Mozambique. This country has some of the best coastline and islands we’ve ever come across, so it’s no surprise that we were able to enjoy the sun dipping into the ocean on many occasions. 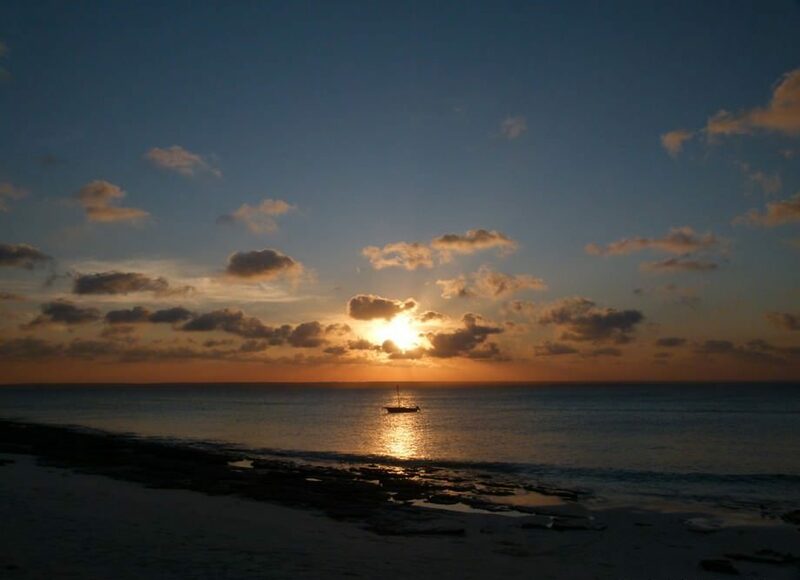 This sunset comes from the village of Vilanculos, a great jumping off point to visit some surrounding islands in the Bazaruto Archipelago. Visiting the beach town of Tofo in Mozambique was definitely one of our highlights in this country. Here we snorkelled with Whale Sharks, went diving with Humpback Whales, wandered around the very small village, met amazing people and of course, enjoyed stunning sunsets every night! It is a magical place. Essaouira is a beautiful place in Morocco. 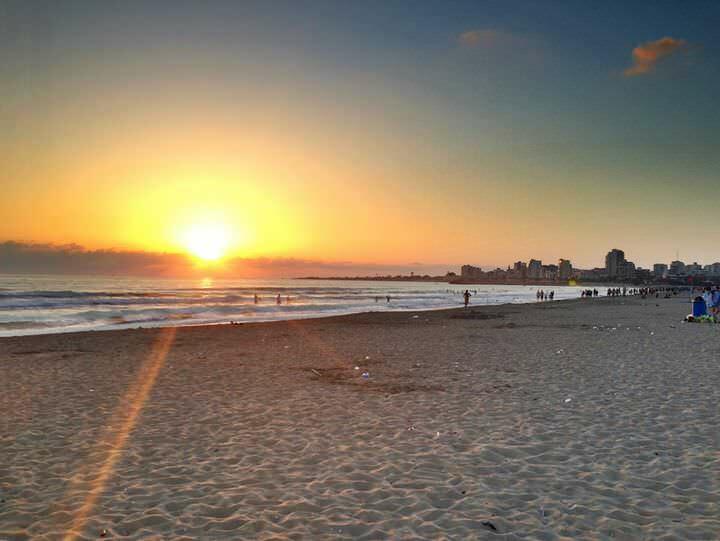 This coastal city has a huge beach, a perfect setting right on the coast of Africa, a wonderful medina, great fresh fish, and of course…spectacular sunsets. We spent a few days here relaxing on our beautiful patio enjoying the views. 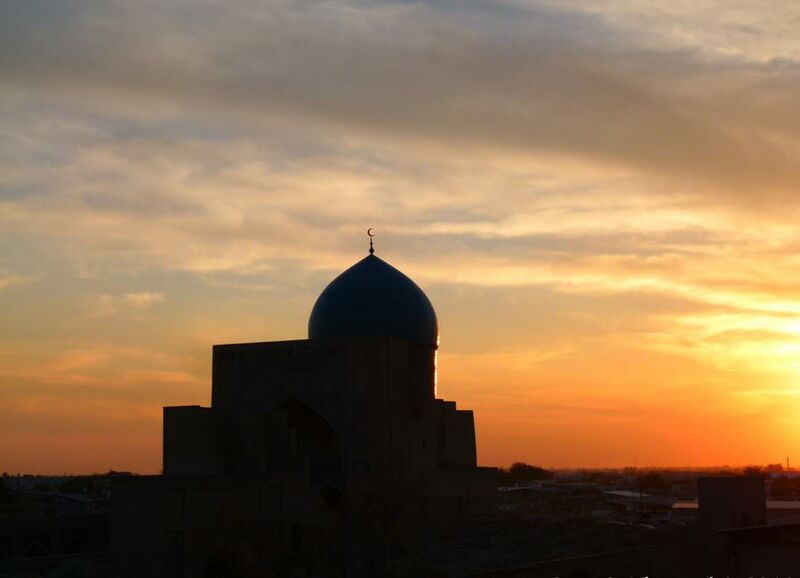 This beauty was taken in the ancient city of Bukhara in Uzbekistan. Wandering around during the daytime and gazing up at the beautiful mosques, mausoleums and monuments was so surreal. During the evenings we went up to a nice restaurant and enjoyed views like this one. 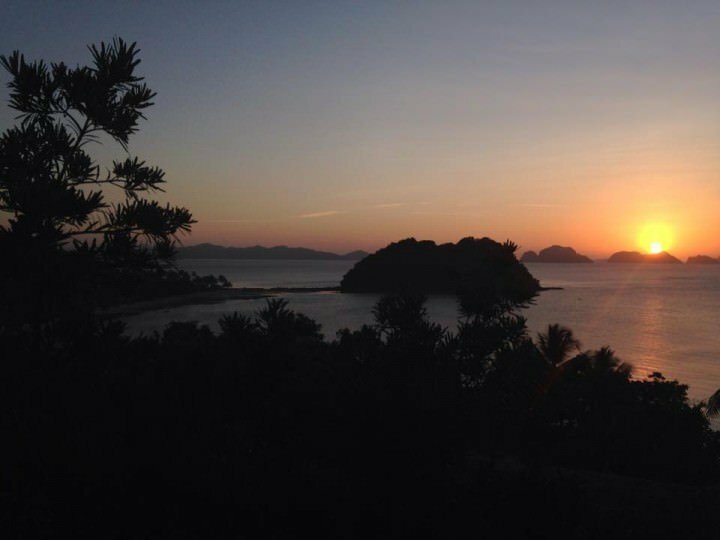 The sunsets in El Nido were some of the best ever. We took this lovely photo from our deserted island. We spent 2 days on an island, sleeping underneath mosquito nets, just the two of us and two friends. It was one of the best experiences we’ve had, and one of the best sunsets we’ve seen. There are over 350 churches on the islands of Malta and Gozo! 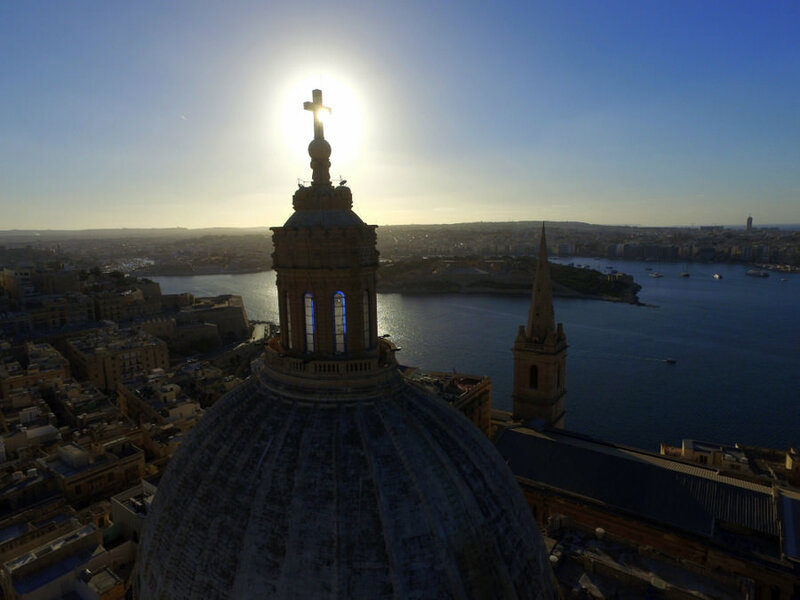 This is a drone view of the top of the Basilica of Our Lady Mount Carmel in the UNESCO listed capital of Valletta. On Thailand’s northeast coast, there is an island called Koh Chang. This beautiful island is often overlooked by travellers who think that the best beaches are only found in the south. 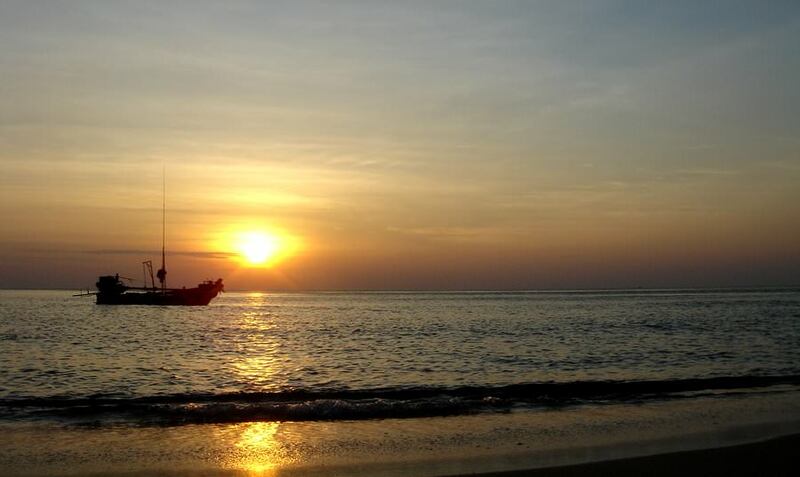 But, Koh Chang has some gorgeous spots and amazing sunsets. 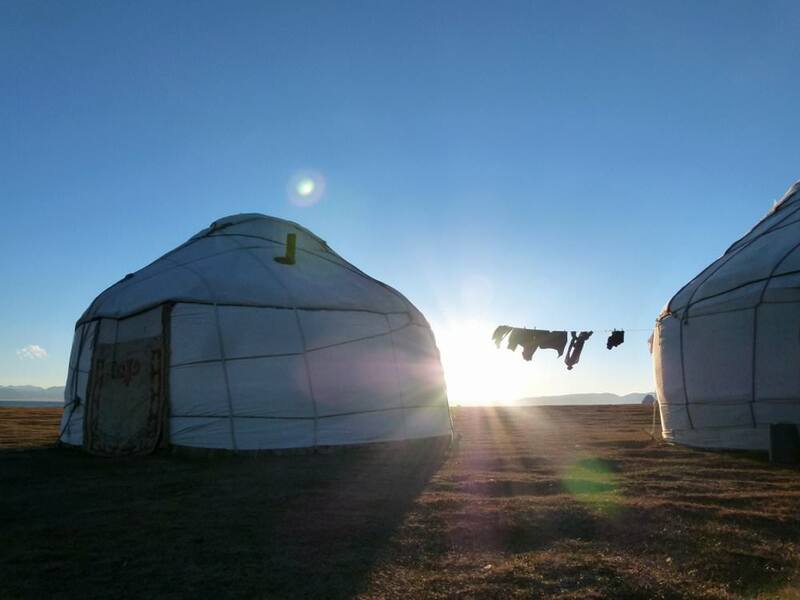 Staying in a yurt when travelling to Kyrgyzstan is an absolute must. We went on a horse trek for three days from Kochkor to Lake Song Kol, and this was our yurt for the night on the lake shore. We’re excited to share this photo from Shelby Fields Kraus, an avid traveller and reader of ours. 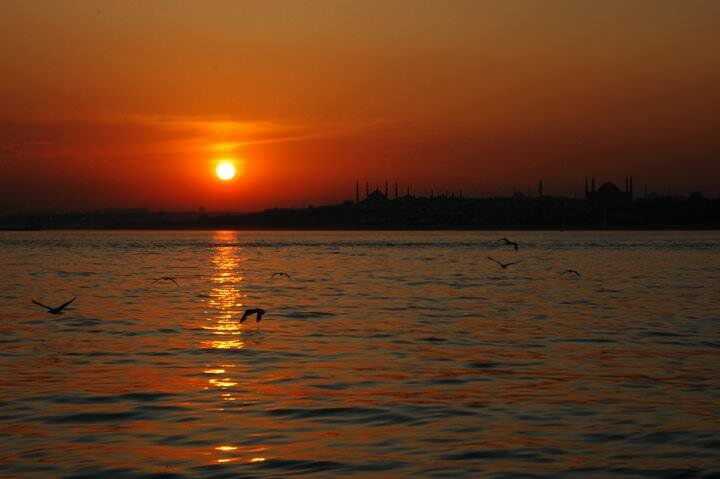 Yes, it’s another sunset from Istanbul. It seems all too easy to capture amazing photos of this magical city. 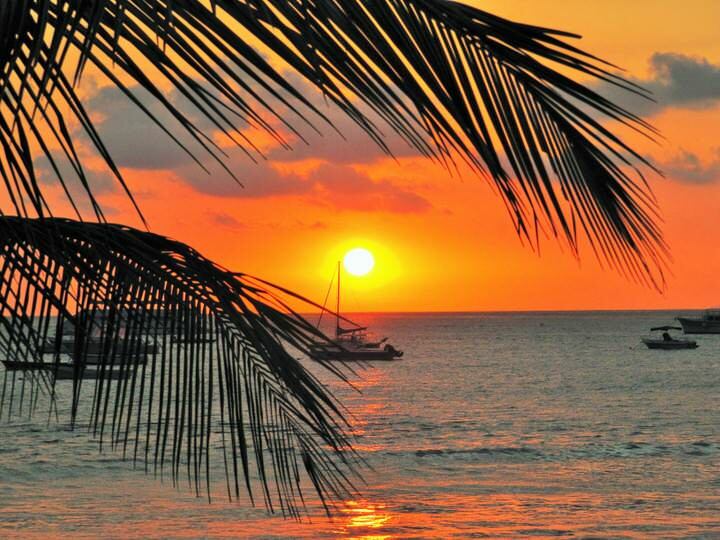 This sunset is from Barbados. On most nights while pet sitting on this island, Dariece and I would head down to Accra Beach and watch the sunset on the Caribbean Sea. 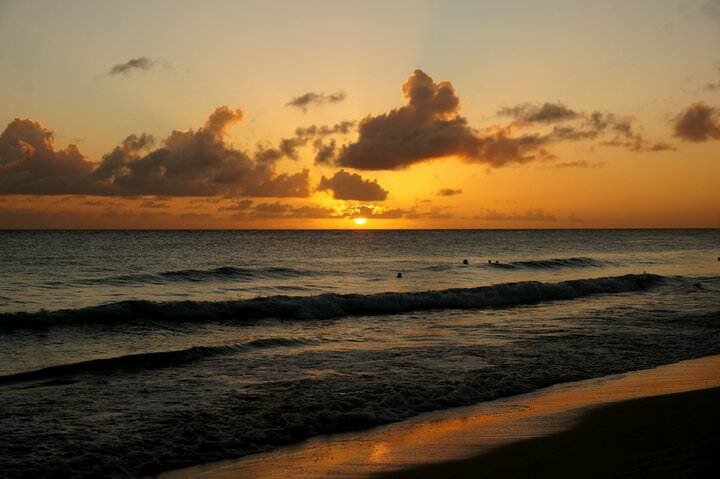 This is another beautiful sunset from Barbados. We really couldn’t get enough of them while we were living there. 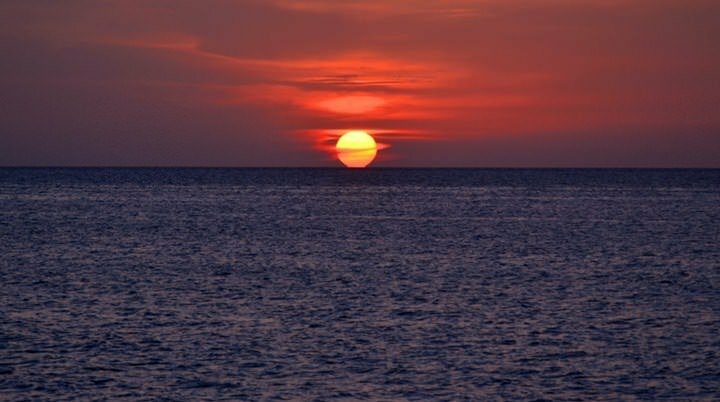 For some reason, the Caribbean produces some of our favourite day-end spectacles. 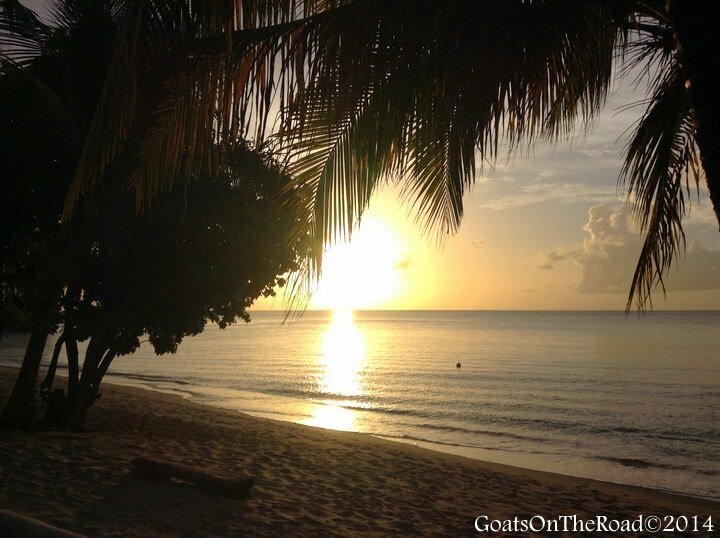 Mullins Bay was another one of our favourite spots to watch the sun kiss the sea in Barbados. After the sun was low in the sky, most of the families would go home, leaving us to enjoy the sunset alone on the sand. This sunset is from Xcalak, Mexico. 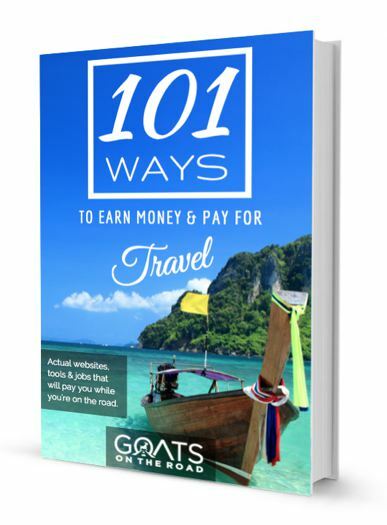 Thanks to Heather from The Travel Type for sharing with us! 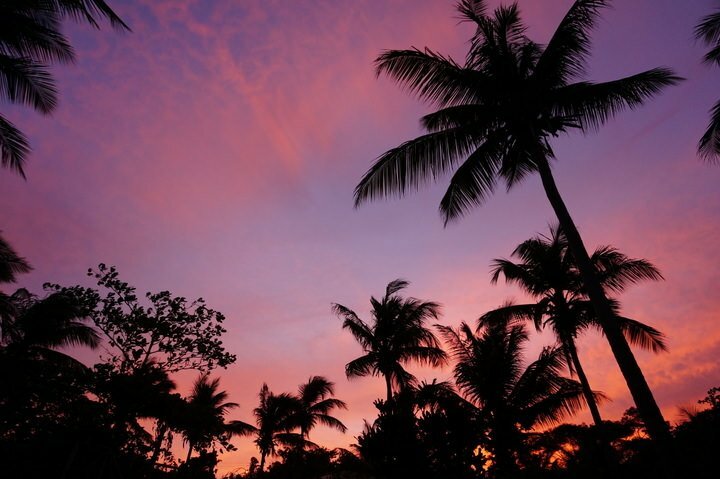 This sunset is from Boracay in the Philippines. 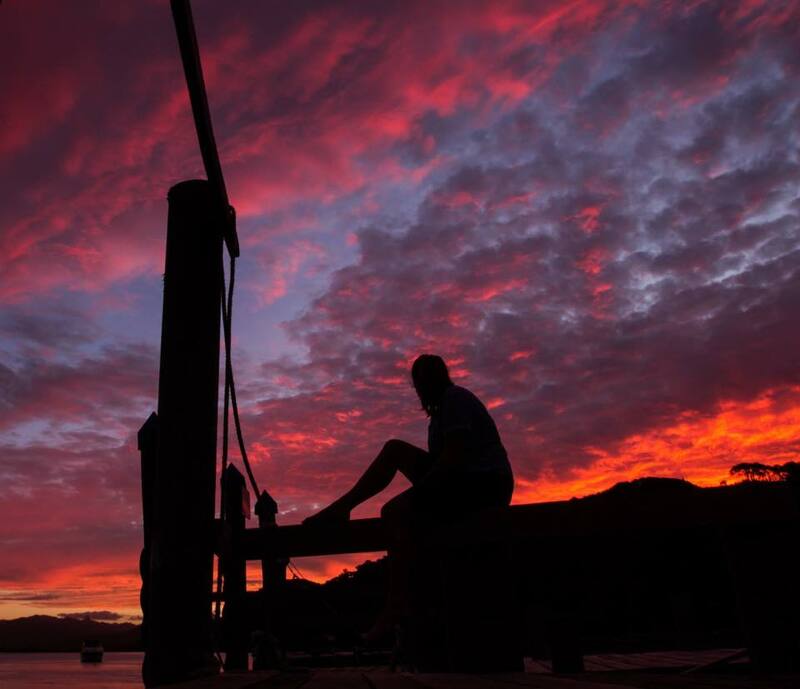 Thanks to Miriam from Adventurous Miriam for sharing this amazing shot. Grenada is most likely our favourite island in the world and we have spent nearly 2 years living here. 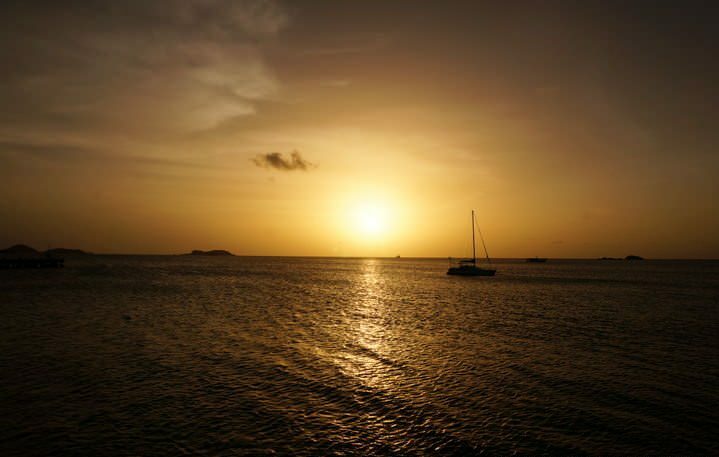 We call it home, so it’s no surprise that we have countless sunset quotes and sunset photos from this tiny Caribbean Paradise. We saw this sunset just the other night, and even though there were clouds in the way, I think they only added to the beauty. This sunset is from Cape Horn at the bottom of South America. Thanks to Elizabeth from CompassAndFork.com for sharing this golden beauty with us! 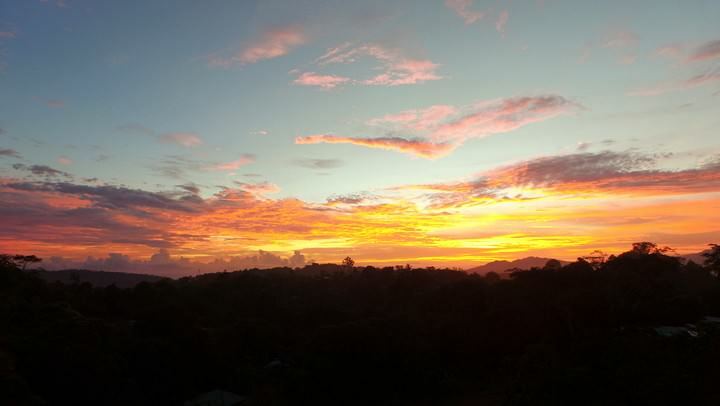 This sunset is from our temporary home in Grenada. One minute the sky was normal, the next, it was painted with pink! 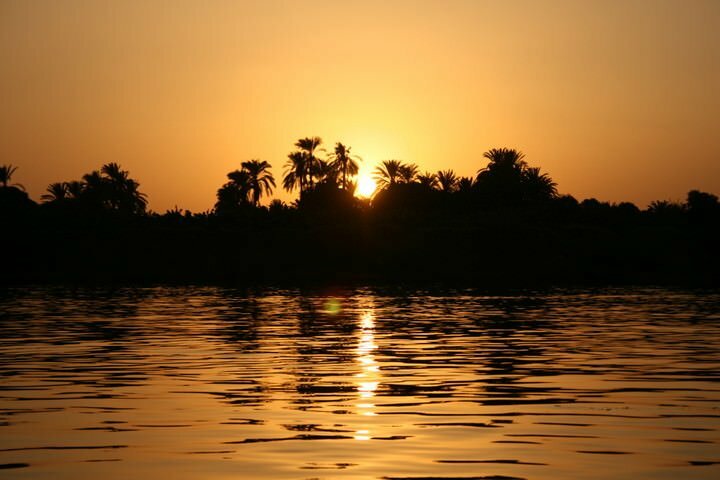 This sunset is from the Nile River in Egypt. A big thanks to Carly of Carlys Adventures Afar for sharing this golden beauty with us! What an incredible shot. This sunset is of the Atlas Mountains in Erfoud, Morocco. Thanks to Ron and Michele of Legging It for sharing this photo with us. 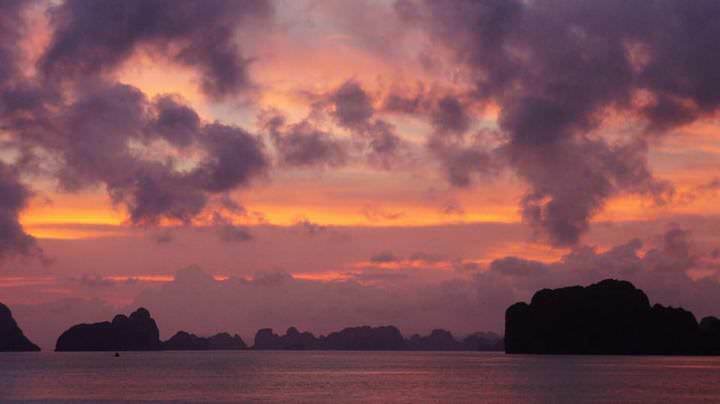 This sunset is from Halong Bay, Vietnam. Thanks to our reader and fellow traveller, Kyle Birkett, for sharing this beautiful photo with us. 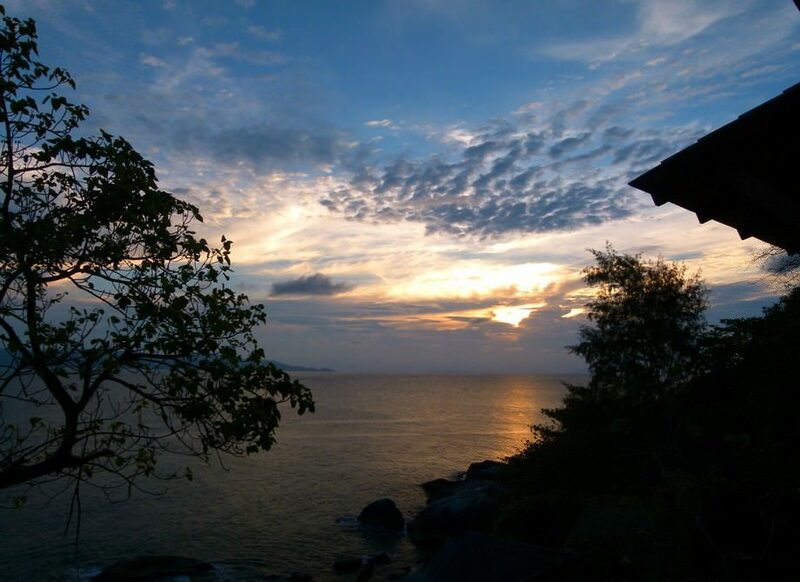 This week’s sunset is from the Tioman Islands, Malaysia. You can tell that this sunset was taken at the last possible moment in the day. A big thank-you to Martin Kjellberg for sharing this incredible photo with us! 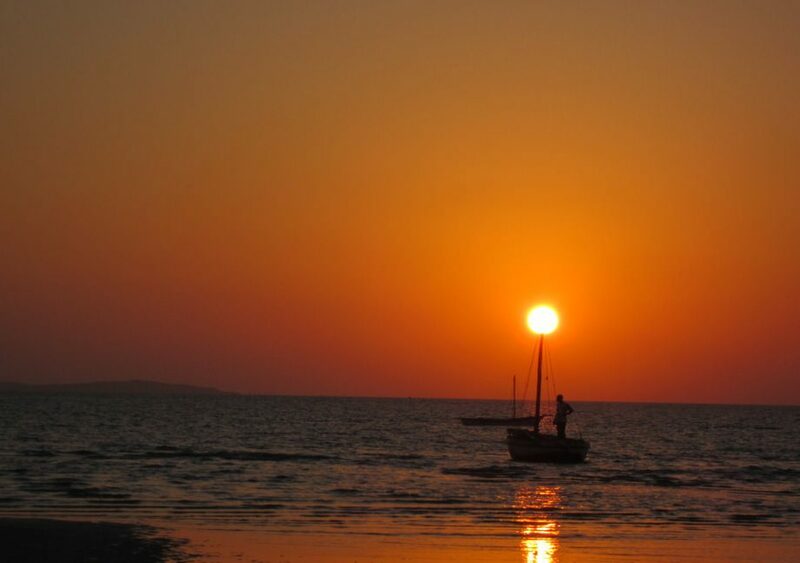 This sunset is from Darwin, Australia. The theory is that sunsets are better in Darwin. A big thank you to Christina Czubak of World Of Voyage for sharing this beauty with us. 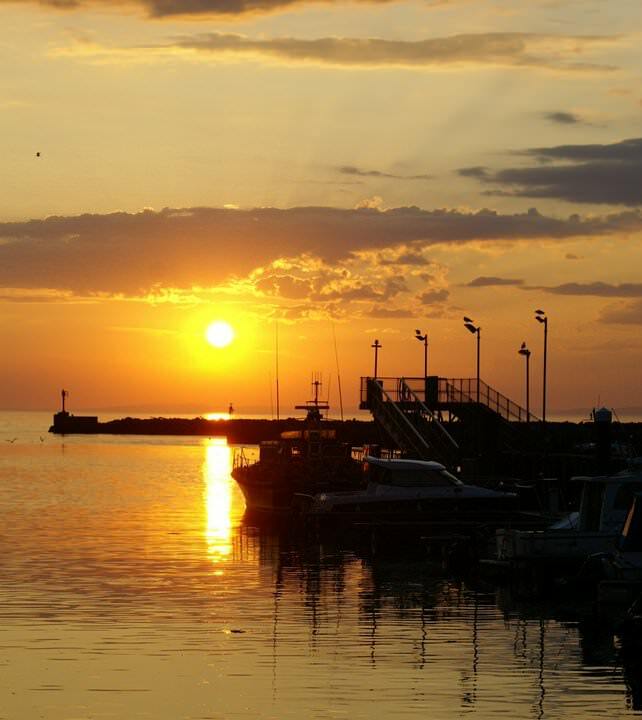 Joining a sunset boat ride on Lake Issyk-kul is one of the best things to do around Karakol. This area is mostly known for trekking, but once you come down from the mountains, make sure to enjoy the other activities on offer in this Kyrgyz town. We were inside getting dinner ready when I peaked out the window and saw the sky on fire! Nick quickly assembled the drone and we flew it high above the treetops to get this gorgeous shot. We would’ve gone higher, but the battery was dying. There’s just something about sunsets on the Pacific Coast. 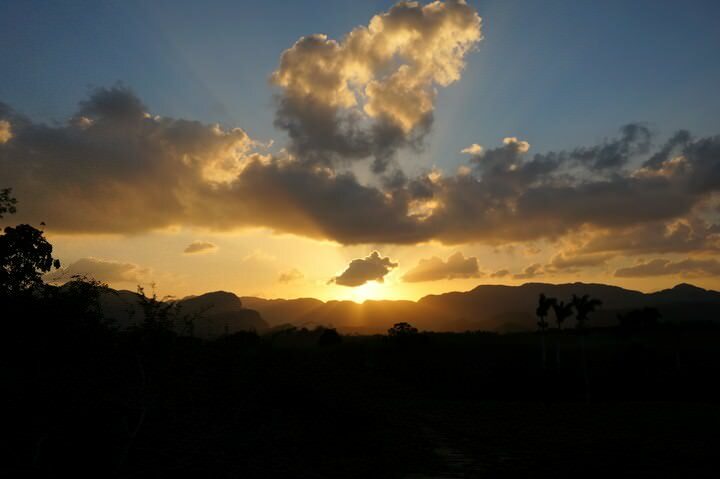 During our 3.5 week trip to Cuba, we spent 4 days in Viñales, which is located in the western part of the country. We rented a little scooter and found our own secluded spot for sunset each night. This golden beauty is from Tyre Beach in Lebanon. We don’t know of many people who have been to this little Middle Eastern nation and were very excited to see that our reader Nathan Jordan had been! 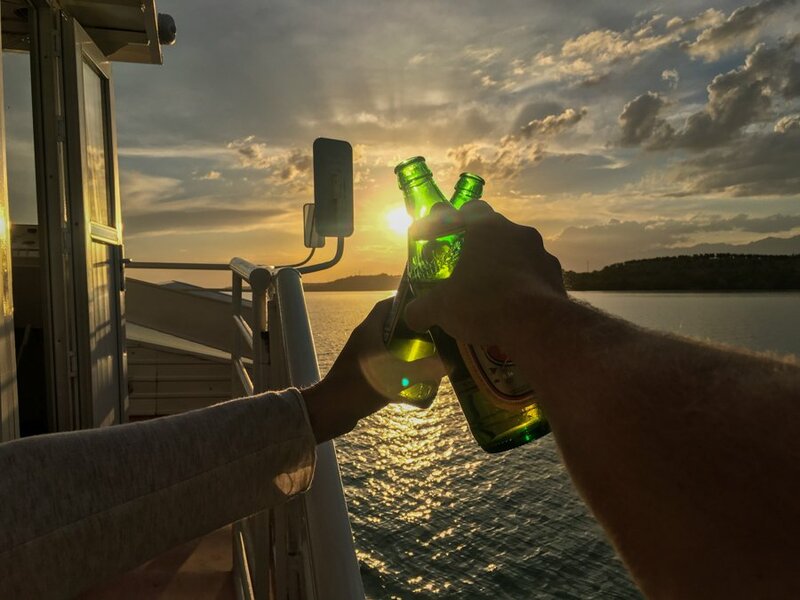 Thanks for sharing this sunset with us. 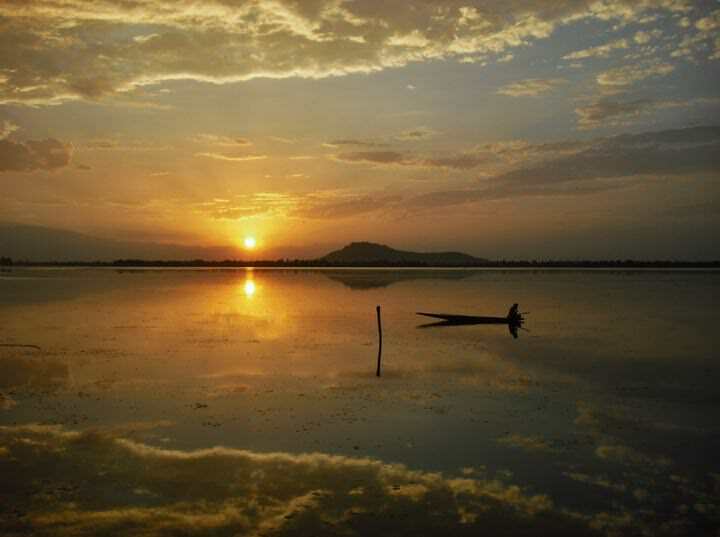 This is Dal Lake, near Srinagar (Jammu Kashmir, Northern India) in 2010. Aren’t the reflections on the water fantastic? 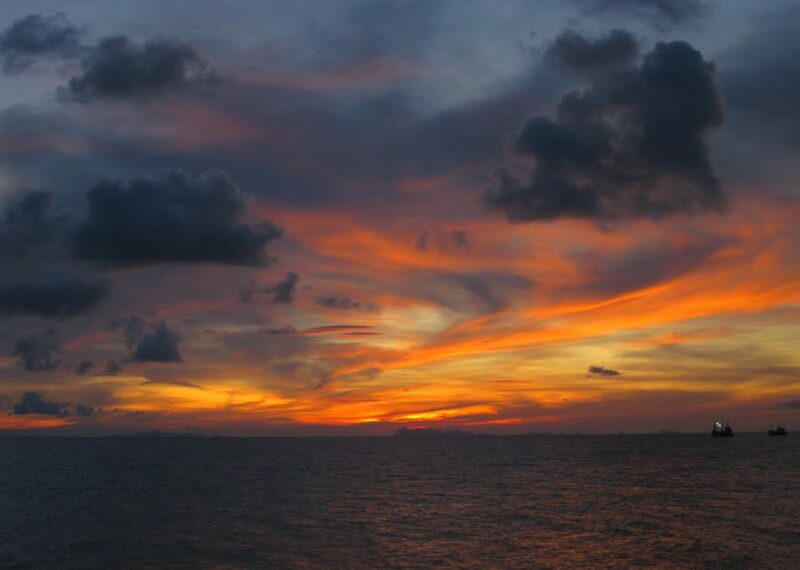 Thank you to our reader and ultimate traveller, Helga Boom for sharing this sunset with us. 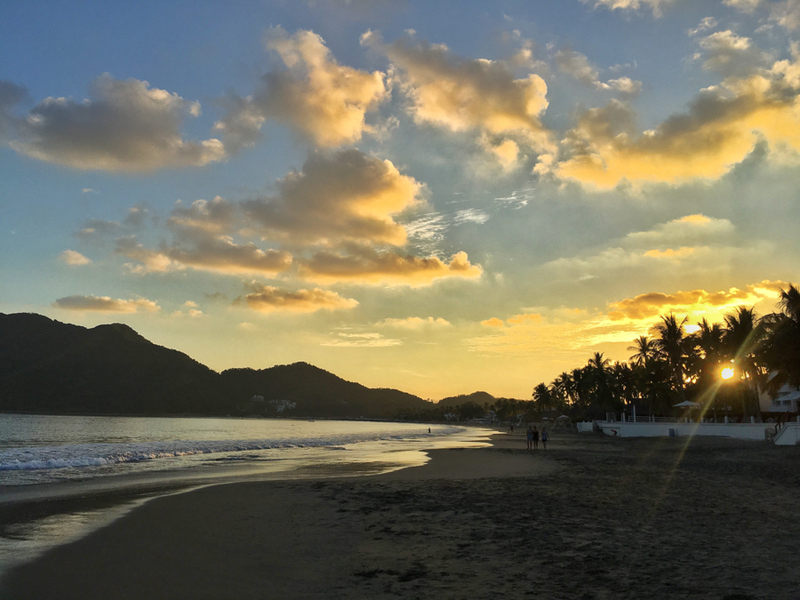 Even though Manzanillo Mexico didn’t win us over with its charm, it sure had some spectacular sunsets. This one was caught on Santiago Bay. 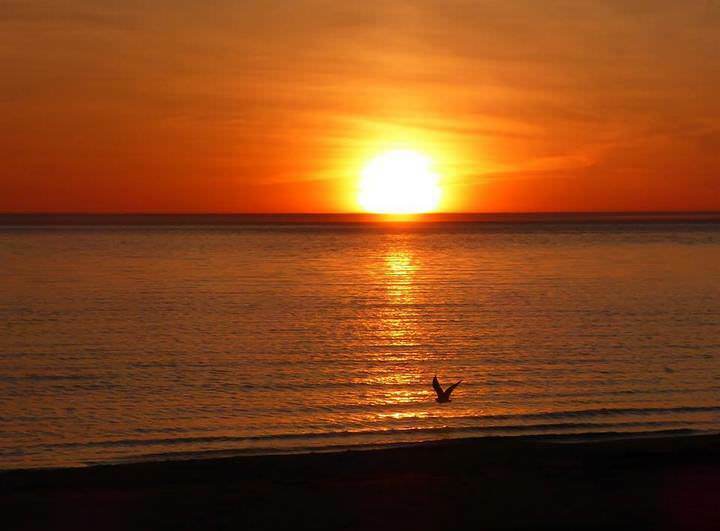 Thanks to our Facebook fan and fellow traveller, Karen Chmilar, for sharing this golden beauty from Canada with us. 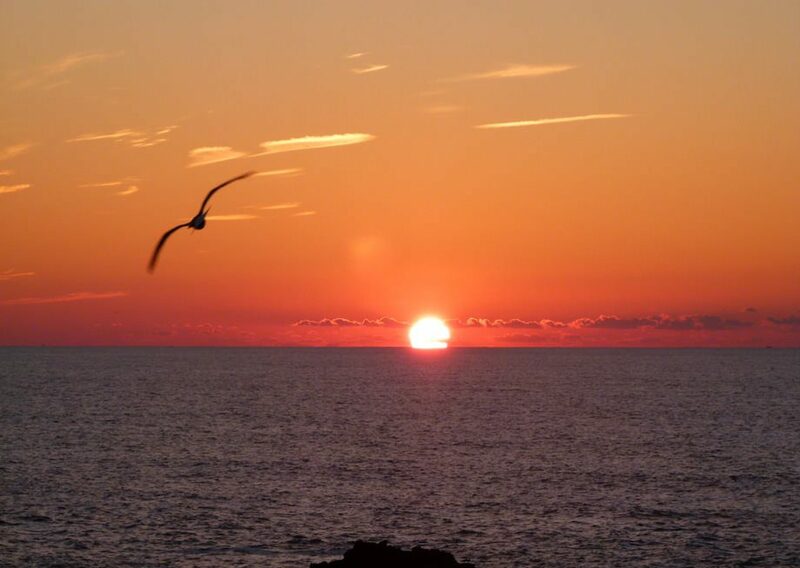 Thank you to our reader, Dee Craig, for sharing this gorgeous sunset from Girvan, Scotland with us! We love how golden it is and how it reflects on the water. After searching high and low for the perfect casita (small home), we found it. 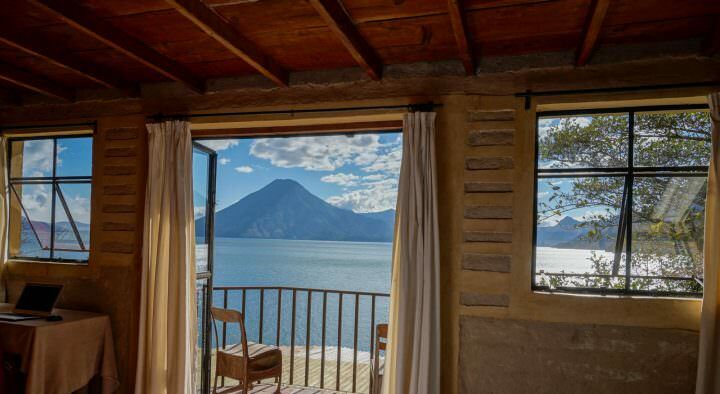 Located on the shores of Lake Atitlan, in the area of Paxanax, this was our view for a month. 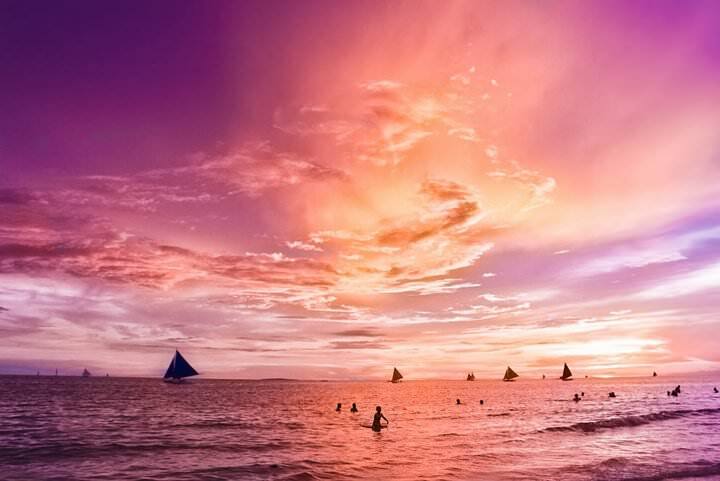 This is another stunning sunset photo from the island of Boracay in the Philippines. Thanks to Mads and Camilla of The Two Hobos for sharing this beautiful golden photo with us. 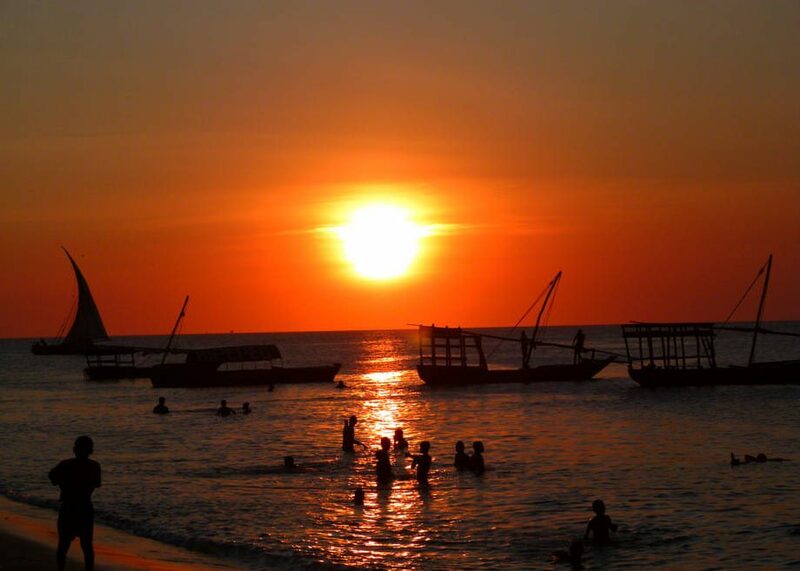 This week’s sunset is from the fishing village of Los Cobanos, El Salvador. A huge thank-you to Vanessa Schoeck for sharing this stunning photo with us! 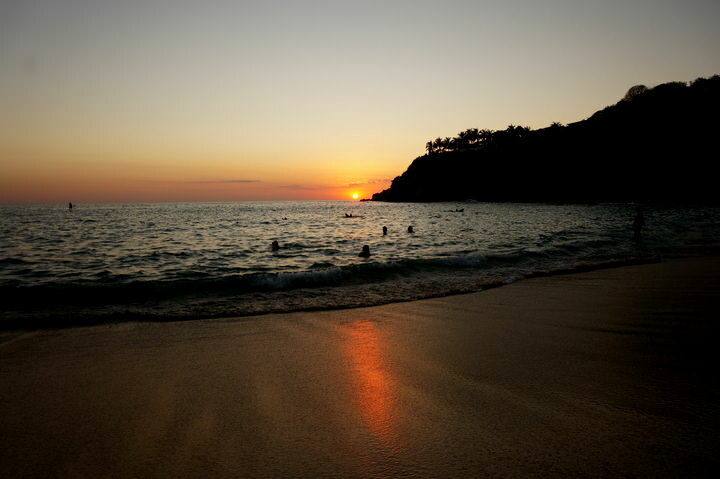 The orange coloured sunsets from our favourite beach in Puerto Escondido, Mexico are stunning. We watched the sun touch the water each night with an ice-cold Corona! Beautiful. We loaded up the cooler and our bags and made our way down to the beach in San Pancho for sunset on Christmas Eve. 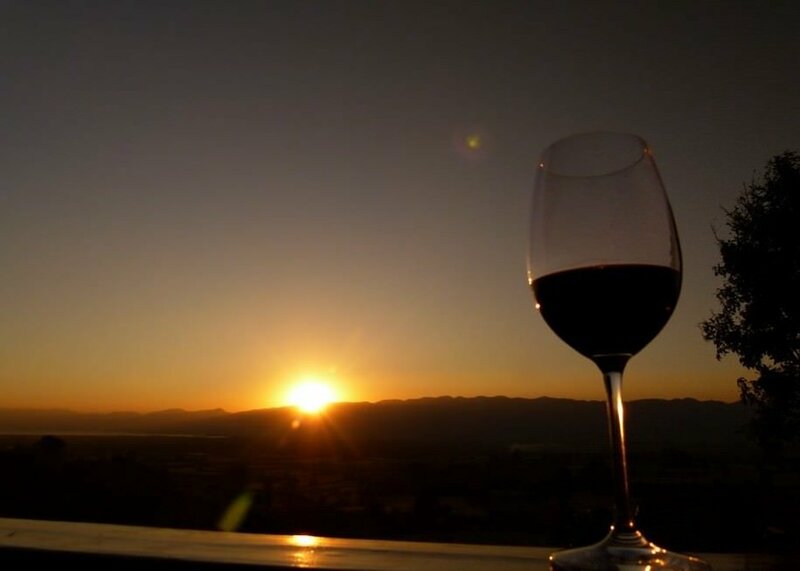 With a glass of wine in hand and a plate full of cheese and crackers, we bid farewell to the day as the sun lit up the sky. Thanks to Shikha for sharing this beauty with us. This simple but near-perfect, coral sunset was captured earlier this summer in Cuba along the Malecon, Havana’s long, seafront promenade. 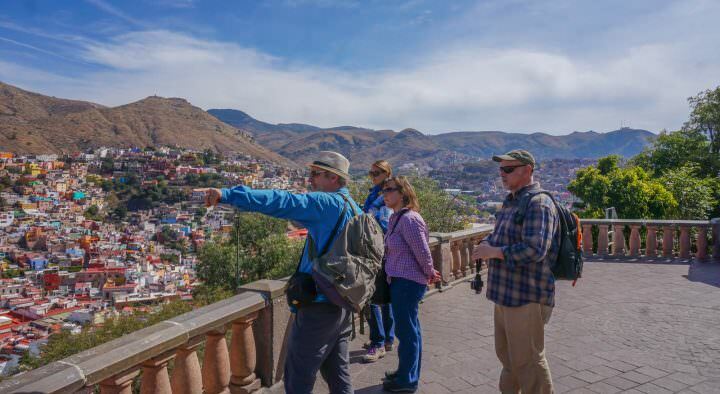 The Malecon comes to life in the early evenings with tourists and locals gathering alike. Here you can spot fishermen reaching the end of a day’s work, couples canoodling and Cuban men laughing together to generate a palpable buzz. But as the sun starts to set, the noise diminishes except for the sound of the vintage cars whizzing past and all eyes face these glorious sunsets. The silence of the submerging sun provides a stark contrast to Cuba’s colourful chaos. 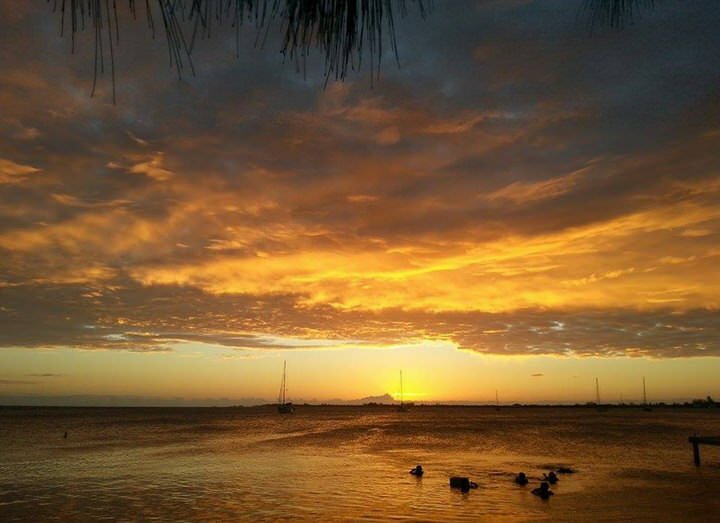 A big thanks to Vanessa Schoeck for sharing this beautiful sunset with us. 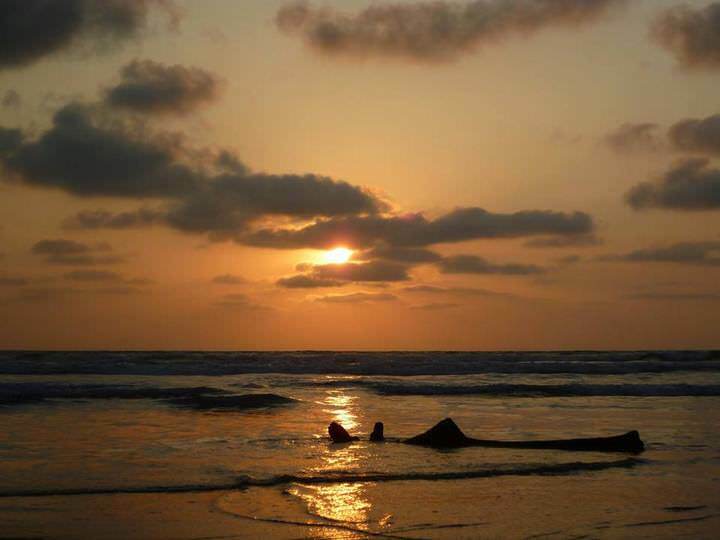 This picture was taken in Canoa, a small beach town in Ecuador. It’s a famous surf spot with laid back people. 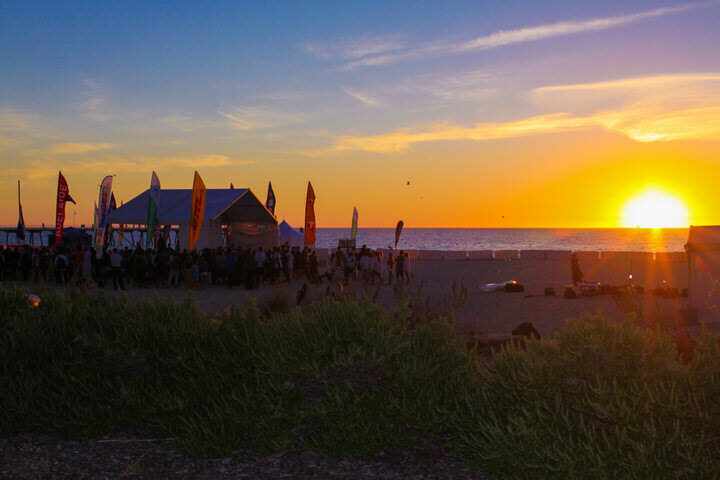 Each evening in San Pancho, Mexico (San Francisco), everyone heads down to the beach to say goodbye to the day. 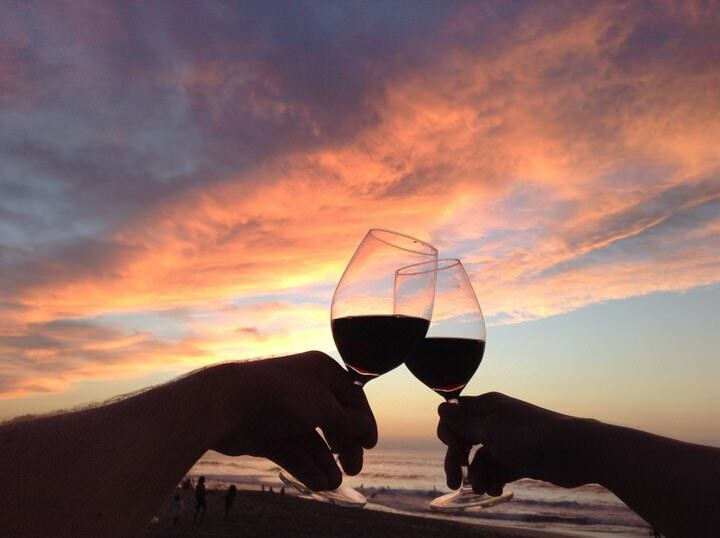 It’s the perfect place to meet up with friends, have a glass of wine and enjoy the sunset. 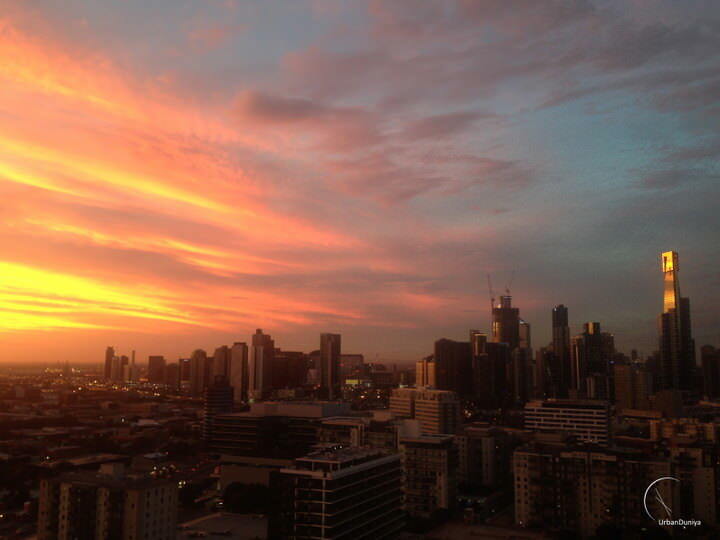 Thanks to Tim Blight of Urban Duniya for sharing this beautiful photo with us. “I had just arrived in Melbourne, Australia from three months in Lahore, Pakistan last December when I took this picture. I had stumbled off the flight at 3am, and slept through until 4:30pm… I woke up, feeling depressed to be back, and frustrated that I was so jet lagged. We’ve seen many sunsets in our life, but the one we just witnessed on Nick’s 30th birthday was magical. We were on a boat that was cruising across the Bay of Banderas when the sky started to come to life! Part of the sky was still blue, while the other surrounding the sun changed to red, orange, and pink. 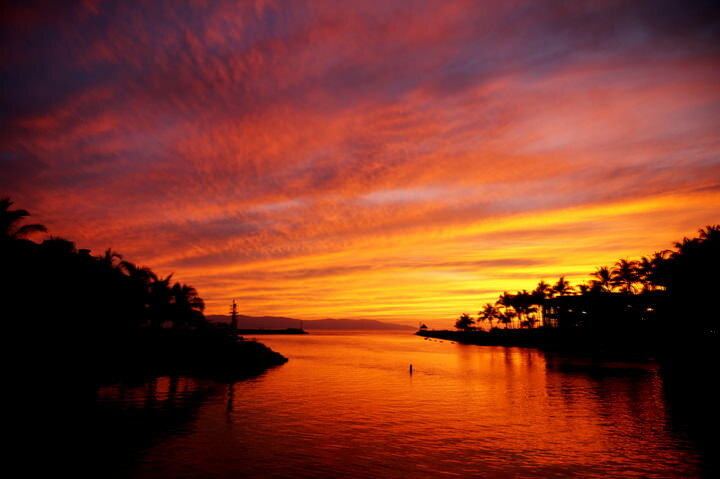 Watching sunset is one of the best things to do in Puerto Vallarta for sure. 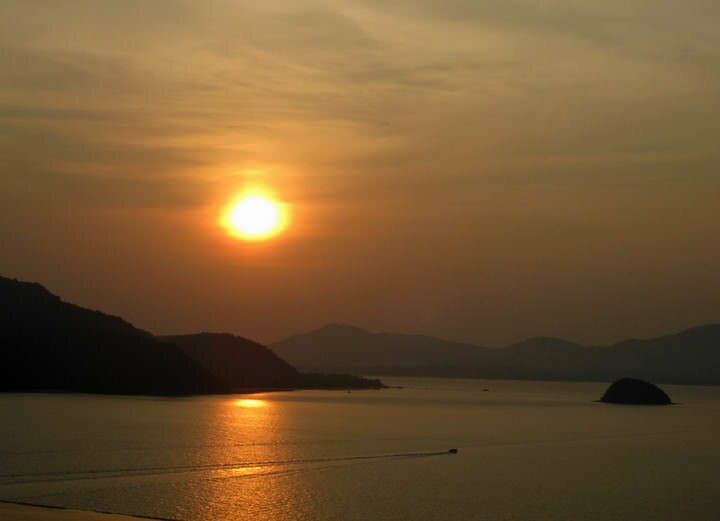 This sunset is from Langkawi Island, Malaysia. 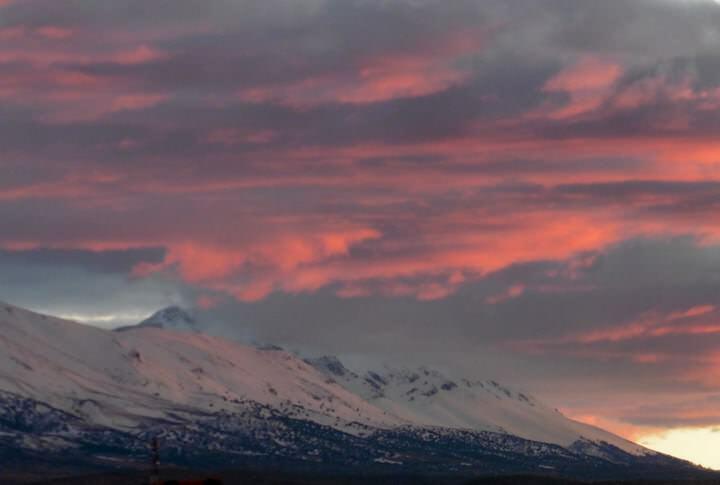 Thank you to our reader, Vicki Austin Dimin, for sharing this beauty with us. We miss Malaysia! Located on the southern end of the Island of Grenada, next to our favourite swimming beach (Morne Rouge), you’ll find the lovely La Luna Resort. They have a great happy hour, beautiful beach for swimming and of course, a perfect spot for watching the sun set. 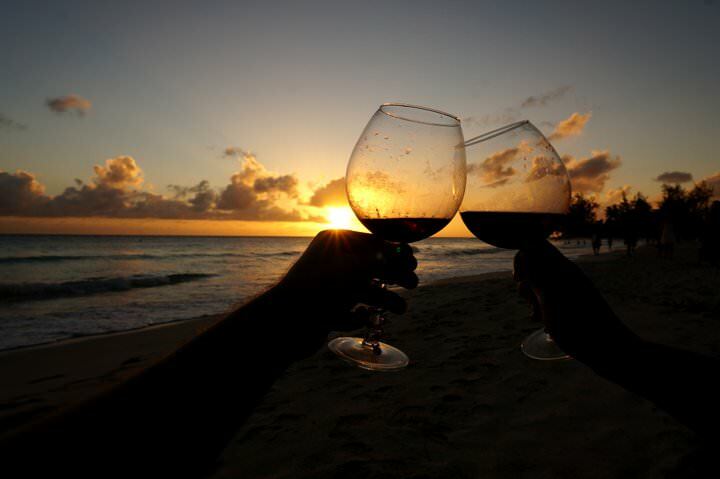 We love watching the sun dip into the water with a glass of red wine in our hands. Paradise! This is a stunning sunset photo over the rice paddies of Punjab. 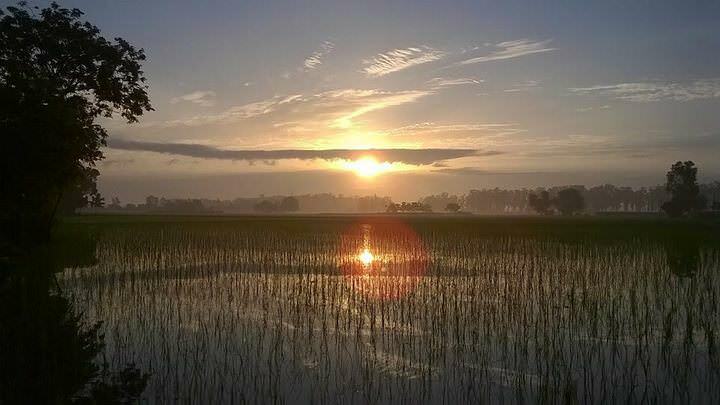 Thanks to Evelise Jolysimoes, a reader of ours, for sharing this gorgeous rice paddy sunset. Crazy and chaotic sum up Indonesia’s capital of Jakarta. The contrast there is unforgettable, with giant skyscrapers glistening in the background of broken down dwellings in the kampungs (residential villages) with trash-filled waterways. Keeping up with the contrast, a storm raged through the city and just before sunset it suddenly stopped. 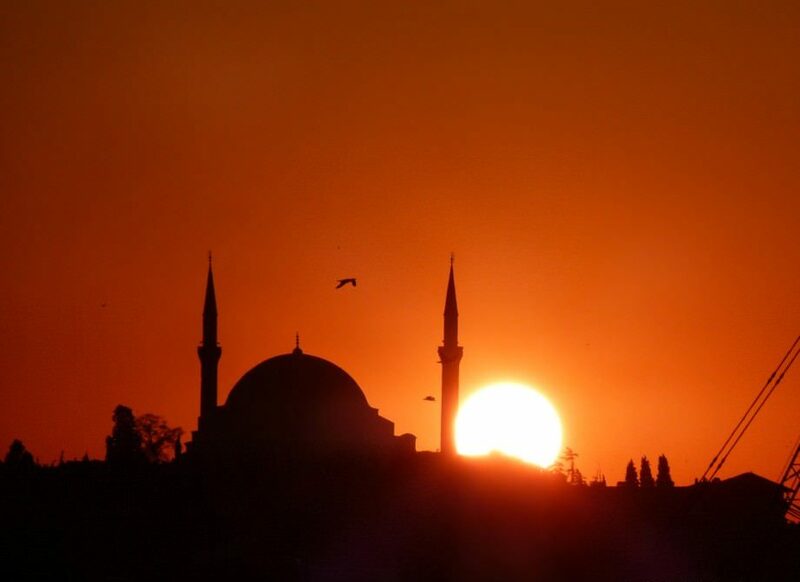 The call to prayer came over the loudspeakers throughout the city, as the sun came out for one last brilliant glimpse until it faded into night. This picture was taken on the rooftop terrace of our guesthouse in a kampung just outside of central Jakarta. Thanks to Katie of From Shores to Skylines for sharing this photo with us. 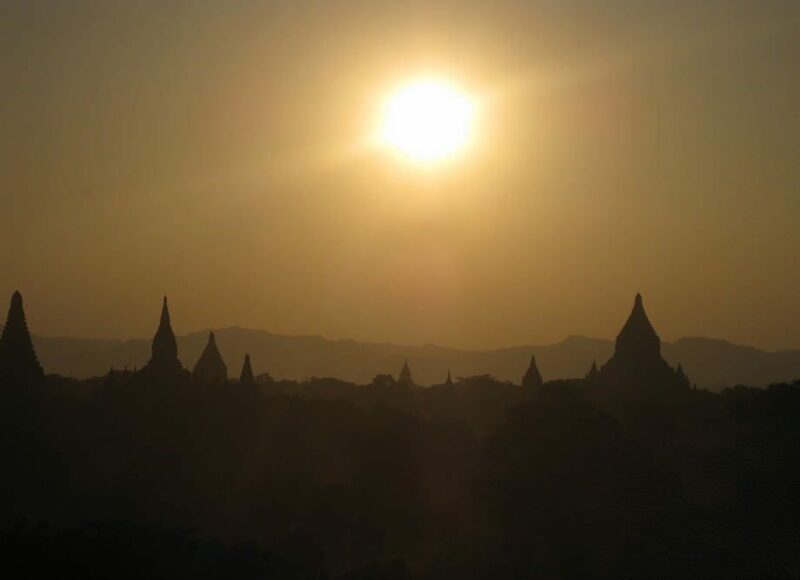 Thanks to Mirna for sharing this lovely sunset, it makes us want to go back to Myanmar! 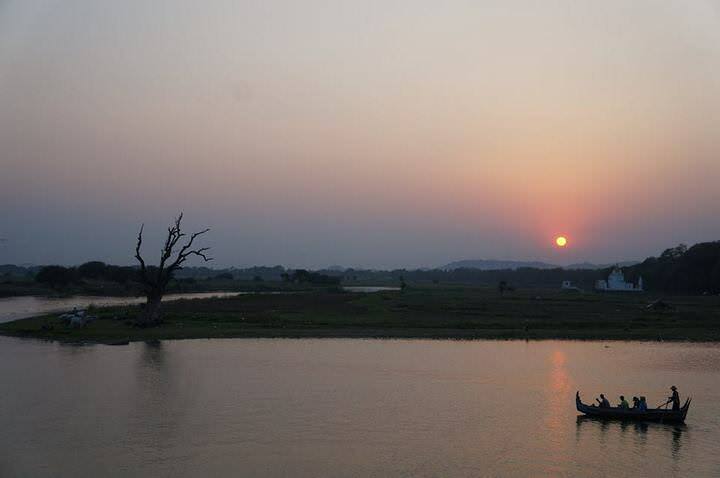 This peaceful sunset was captured about 10 kilometers south of one of Myanmar’s former capitals, Mandalay. U Bein Bridge has evolved from just a necessary path for locals to a must-see for all travellers. Watching sunset from U Bein is so much more than that; monks stroll around draped in their deep red and orange robes, silhouettes of monks riding their bikes are visible all around, the fishermen and their boats slowly move through the lake. This picture wraps up what I love about Myanmar; the natural, untouched beauty which is prevalent throughout the whole country combined with the soft and gentle nature of the locals. This picture is the Myanmar I’ll never forget. 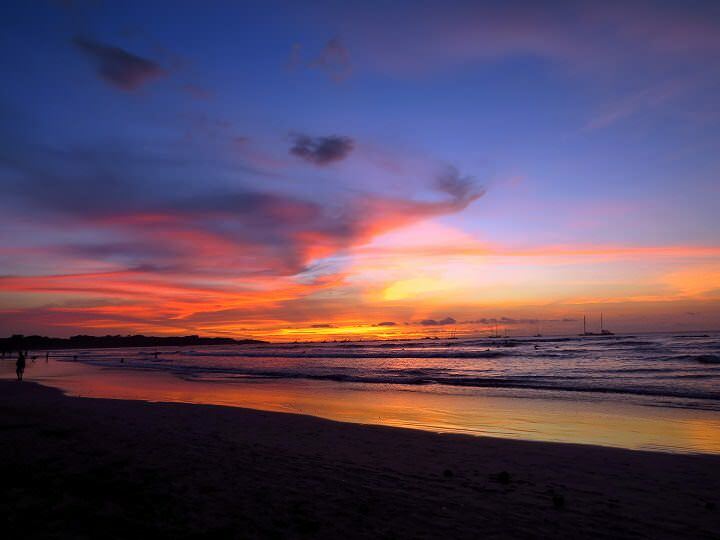 This sunset was taken at Playa Tamarindo, in Guanacaste Costa Rica. It’s one of our favorite beaches to go for sunsets since you get a full view and the colors are always stunning with rays of soft pinks, blues, purples, oranges and yellows. Anywhere you go on the beach you can get an amazing view of the sun going down and it never disappoints. Special thanks to Yeison and Samantha for supplying this photo, a couple currently living in at the beach in Costa Rica. Special thanks to Tim Blight of Urban Duniya for submitting this photo. 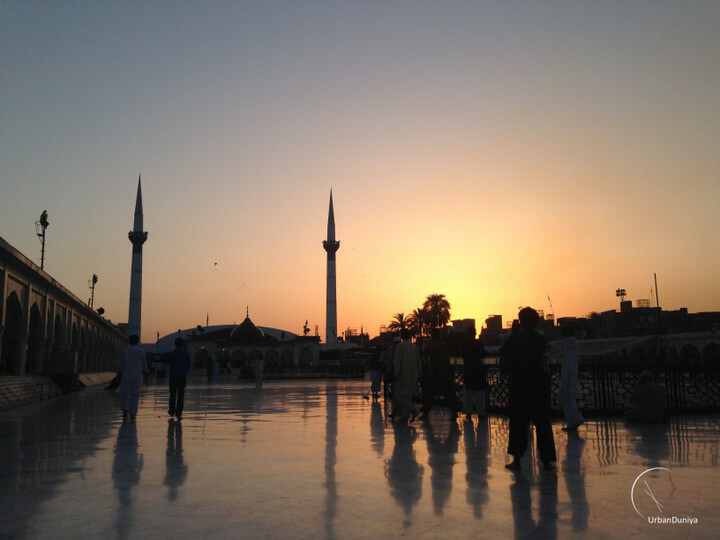 This photo is taken at Data Darbar, a large Sufi shrine in the Pakistani city of Lahore. Data Ganj Baksh was a preacher and scholar from Persia who lived in Lahore in the eleventh century. He is said to have contributed to the spread of Islam in the subcontinent, and his shrine is now one of the most frequented in Pakistan. Cameras aren’t allowed inside the shrine for security reasons, but thankfully there’s no restriction on mobile phone cameras. I visited late in the afternoon with a close friend of mine, and as we entered the main gate I caught this beautiful view of the sun setting over the shrine. Special thanks to Dani Heinrich of Globetrotter Girls for supplying this photo. I just returned to New York City, my favorite city in the world, which also happens to have some of the best sunsets in the world! I love sitting in East River State Park in Williamsburg, Brooklyn, where this photo was taken. The views at sunset are magnificent as you can see almost the entire length of the Manhattan skyline while the sky changes its color slowly from blue to purple to pink and finally bright orange. This is a spot where you find barely any tourists, and you can bring a picnic! I love picking up some fresh food from one of the bakeries in Williamsburg and the divine cheese shop on Bedford Avenue and dine al fresco while watching the sun disappear behind the skyscrapers. 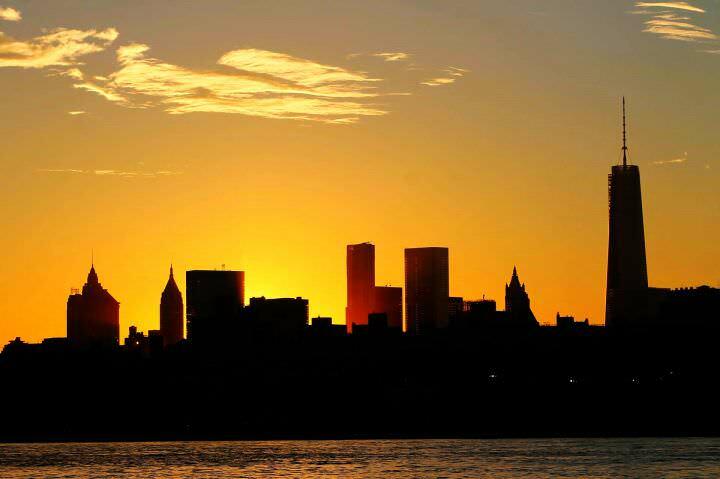 I don’t think I could ever get tired of watching the sunset over Manhattan from that spot. A better known sunset spot in New York is the Brooklyn Heights promenade just south of the Brooklyn Bridge, which has stunning sunset vistas over the southern end of Manhattan. Grenada is actually comprised of three islands; Grenada, Carriacou and Petite Martinique. We decided to do some island hopping for my 30th birthday celebration and Carriacou was the first stop! With only 6,000 people on the island, it’s a pretty chilled out place. The beaches here are gorgeous, the buildings are colourful and the people are warm and friendly. 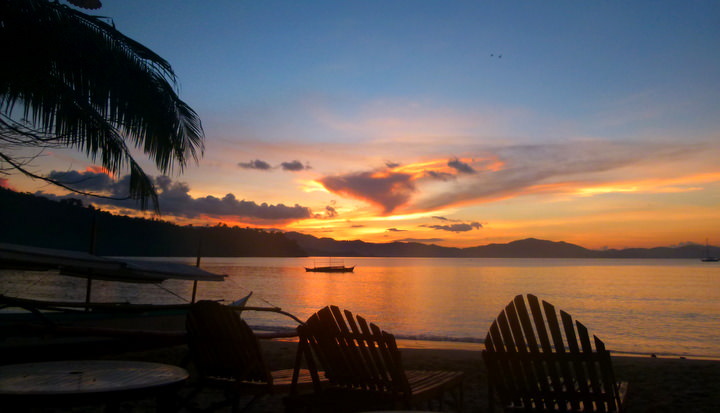 We enjoyed this sunset from one of the beachside restaurants during our first night on the island. A big thanks to Pete & Dalene of Hecktic Travels for taking the time out of their hectic travel schedules to provide us with this beautiful sunset! 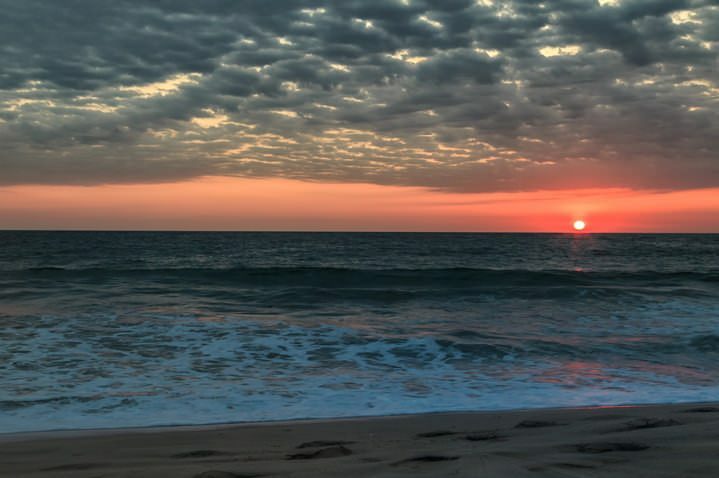 Puerto Escondido, Mexico, referred to in the surf community as the Mexican pipeline, has a beach that stretches for miles from the Centro towards La Punta. It’s here where we stayed for nearly one month lured by the quiet locale and laid back atmosphere. And although our time in Puerto wasn’t the greatest, we were treated to sunsets like this almost every evening. For nearly thirty days we never saw a drop of rain, or even a cloud it seemed like. Each evening like clockwork, the crowds were drawn down to the beach and the skies lit up in hues of pink, purple and orange. It felt almost as if we were trapped in our own episode of Groundhog Day with the same event recreating itself. Except during moments like this, you look forward to experiencing it again and again and don’t want it to end. Special thanks to Audrey of That Backpacker for submitting this photo. 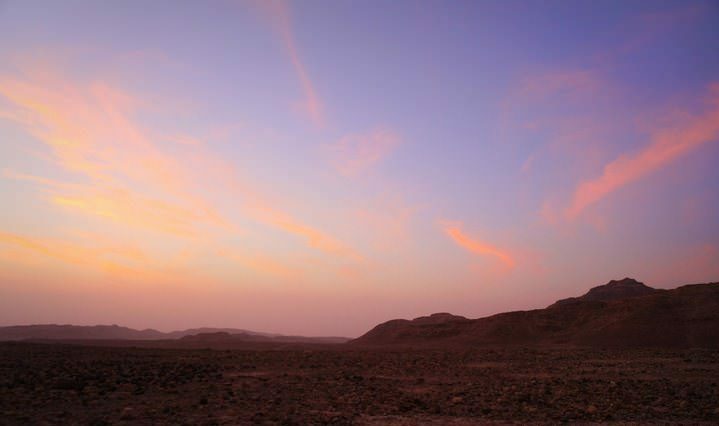 This sunset photo was taken in the Dana Biosphere Reserve – a large nature reserve located in south-central Jordan. What made this sunset extra special is that it was quite a journey to get there. Reaching our sunset spot involved hopping in the back of pick up trucks, riding down bumpy dirt roads, and then being greeted by local children who ran alongside our vehicles waving as we drove through their little communities. When we finally reached the lookout point, the sky was starting to turn soft shades of pink and lavender, which we enjoyed with cups of sweet mint tea in hand. It was the perfect way to end the day and start an evening that would have us marvelling at the stars and enjoying traditional Bedouins cuisine with new friends. A big thank-you to our adventurous friends, Dave & Deb of The Planet D for taking the time out of their crazy schedules to share this photo with us! You can see more of their stunning photography here. Each evening in Greenland, we couldn’t wait to go outside and see what the sunset was going to be like. It was ever-changing as we sailed through different bays and fjords of the Arctic Circle. It was when we were in particularly icy sections of our expedition that we found the sunsets to be most extraordinary. 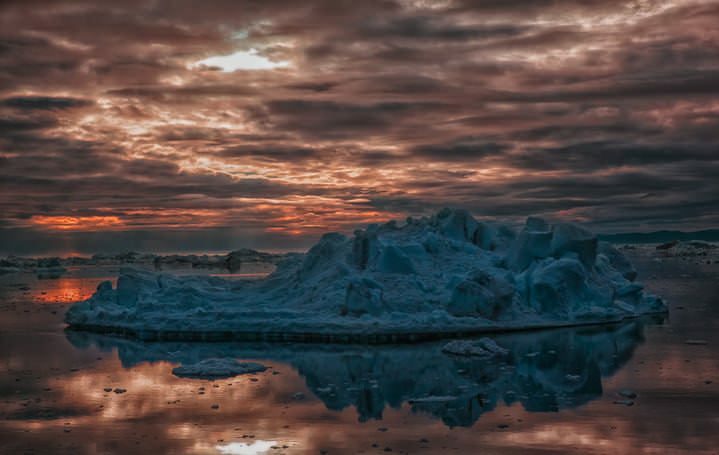 This was a beautiful sunset in Ilulissat, home to the most active calving glacier on earth. The Jakobshavn Glacier produces 35 billion tonnes of icebergs each year so you can imagine how clogged the water was with epic ice as our ship passed by. I don’t know how the captain managed to navigate his way through each day, but he did with great skill and ease allowing us to experience extraordinary scenes like this. 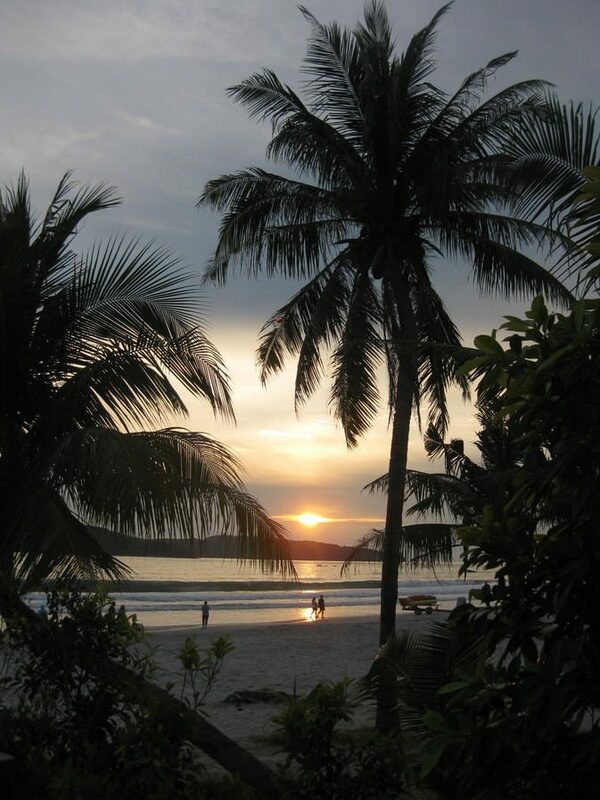 Malaysia is known for its stunning islands, flavourful foods, lush jungles and cultural diversity. We spent some time on a few of the more popular islands before deciding to make our way to the lesser-known Pulau Kapas. The homestay we stayed at for 5 nights was authentic, friendly and memorable, while the beaches were unique, deserted and sublime. Not many tourists come to Kapas Island and we’re not sure why! It’s the perfect place to get away from it all and enjoy late day sunsets like this one. Malawi is a small country on the southeastern coast of Africa. 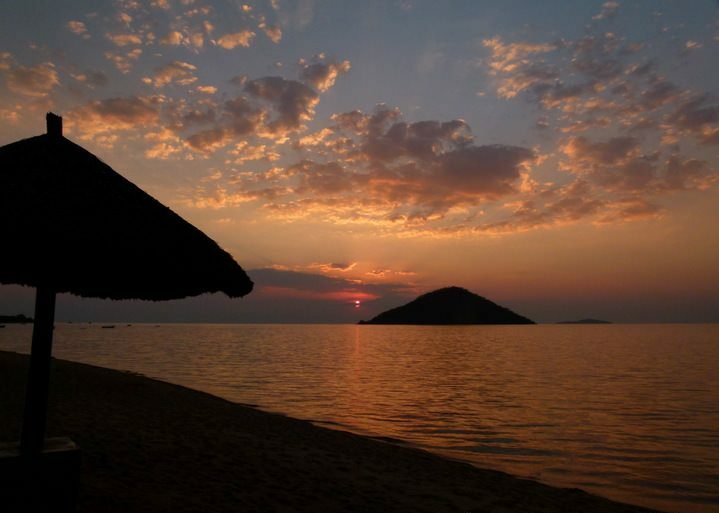 We spent a few weeks here and enjoyed our time at Cape Maclear, also known as the backpacker’s mecca of Malawi. With a chilled out vibe and very rustic village, this is the kind of place you come to get away from it all. 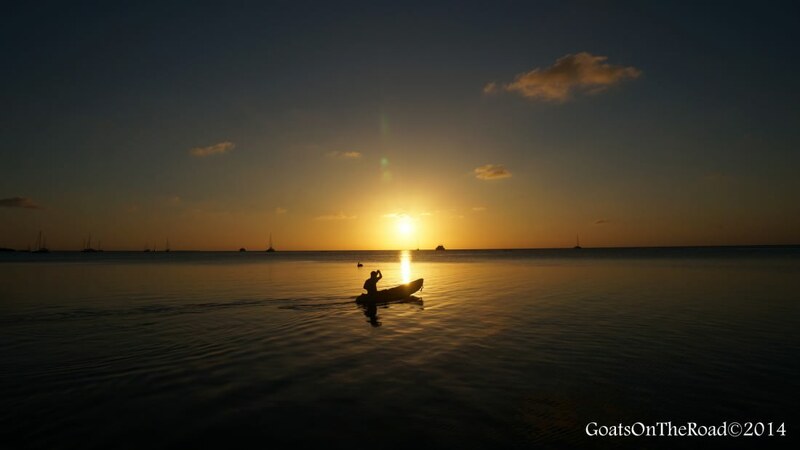 Our days were spent kayaking, swimming, exploring and of course, walking the beach at sunset for beautiful views of the nearby island. Sailing down the famous Nile River was something we definitely wanted to do on our backpacking trip to Egypt. We boarded a felucca boat in Aswan and sailed for 4 amazing days before disembarking at the incredible ruins of Edfu. 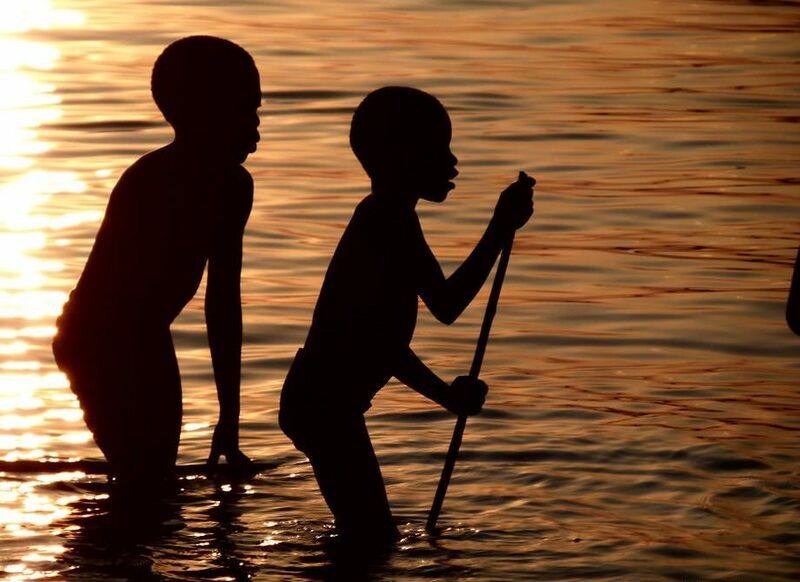 Floating quietly down the Nile River was the journey of a lifetime. We met wonderful people, saw some of the lesser visited sites in Egypt and enjoyed sleeping under the stars. Watching the sun reflect off of the glass-like waters at the end of the day was a definite highlight of our trip. Koh Phangan is the kind of place that you plan on visiting for a few days and end up staying a month! We spent 29 days on this stunning island living the laid-back island life, going to our favourite local restaurants, floating countless hours in the calm sea, exploring on our motorbike and of course, witnessing stunning sunsets at the end of each day. Isn’t the fire coloured sky amazing with the dark, swirling clouds?! 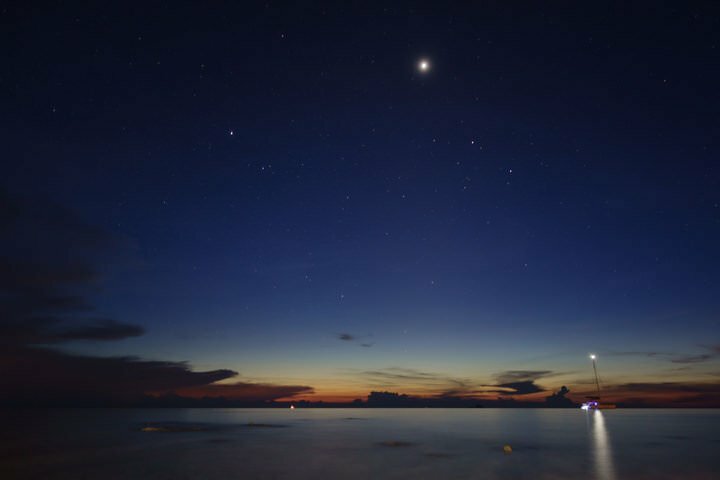 We arrived on stunning Caye Caulker in Belize and found it hard to say goodbye. The relaxed island vibe was contagious, the Creole and Caribbean flavoured food was fabulous and the water was crystal clear and calm. Needless to say, we didn’t want to leave this little gem! The island (technically it’s a caye) is so small that it’s only a 2 minute walk from East to West. We definitely weren’t up for any sunrises, but we made it for sunset. After hitchhiking from the south to the north of Mozambique, we found ourselves at the stunning Quirimbas Archipelago! We waded and hiked through mangroves at low tide between the island of Ibo and Quirimba. We visited a local village, played with the children, mingled with the adults, swam in the sea and I even had my hair braided by an inquisitive woman. The day ended with everyone gathering on the beach to bid us farewell, and we hopped on a boat at high tide back to Ibo Island. Truly a great day in travel. “Never waste any amount of time doing anything important when there is a sunset outside that you should be sitting under!” ― C. JoyBell C.
We absolutely adore the tiny island of Zanzibar. 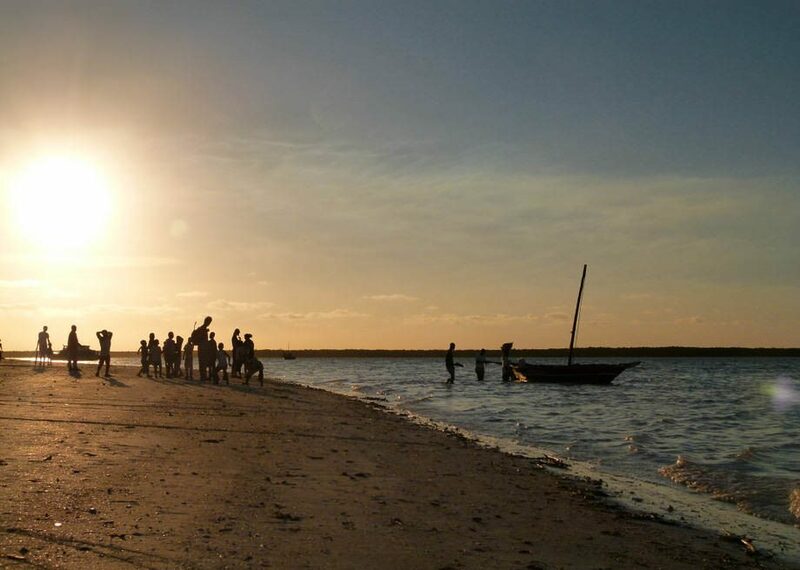 Located just off the coast of Tanzania, this island is full of flavour. Stone Town is especially vibrant and full of character. During the late afternoon, people seem to come out of hiding from the heat of the day to enjoy a dip in the water. Kids play on the beach, boats pass by and couples stroll hand-in-hand. It’s a great place to go for sunset. 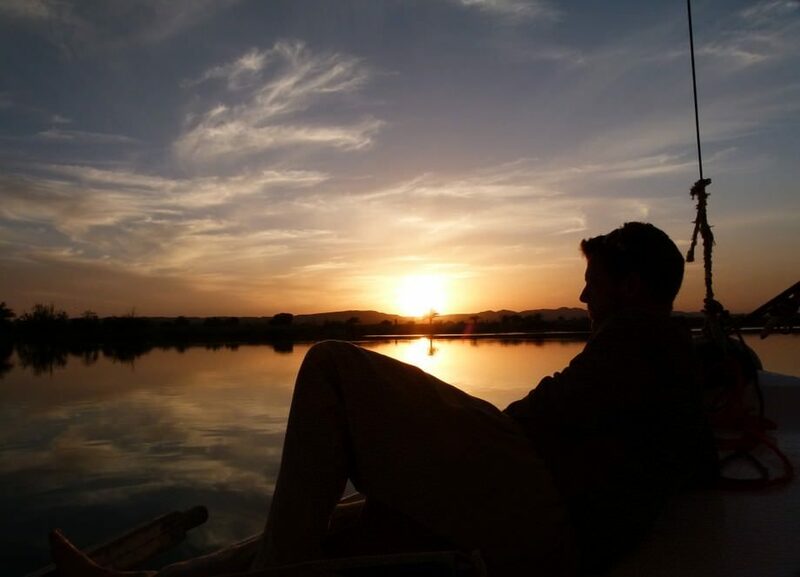 Siwa Oasis is such a special place. Donkeys roam the dirt streets, date palms surround the oasis and a massive mud fort is at the center of the village. The enormous sand dunes called “The Great Sand Sea” are incredible and there are natural springs just a bike ride away. There’s so much to see and do in this little oasis that we spent almost a week here and were never bored. 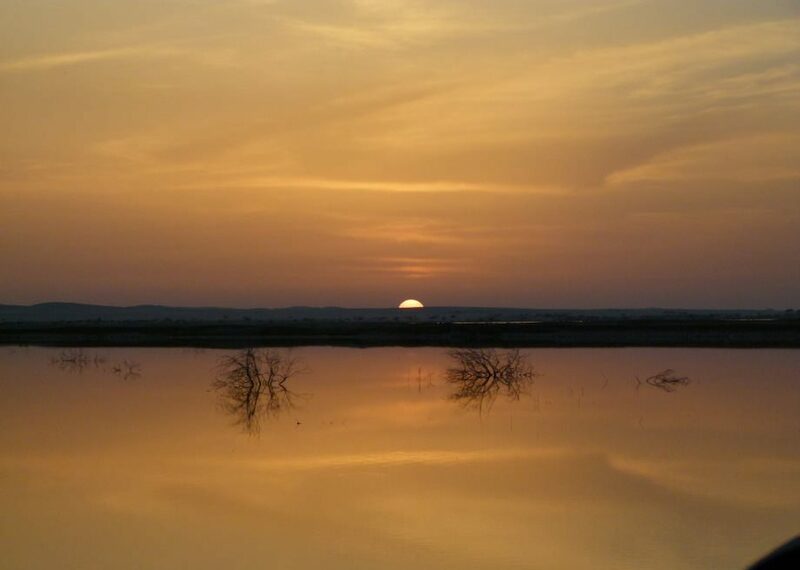 In the evenings, we would ride our bikes down to the Siwa Lake and watch the sun set over the water. Oh how we miss Siwa. After exploring the old city of Jaisalmer in the State of Rajasthan, we decided it was time to make our way out into the desert. We hired our own personal guide (who was hilarious!) and the three of us set out into the vast Thar Desert with our three modes of transportation, camels. We rode our camels for 4 days, stopping for breaks in the shade and at small villages we saw along the way. The nights spent sleeping under the stars on nothing more than blankets was surreal. The stars were twinkling, the camels were snoring, but there was no other sound. It was eerily quiet. 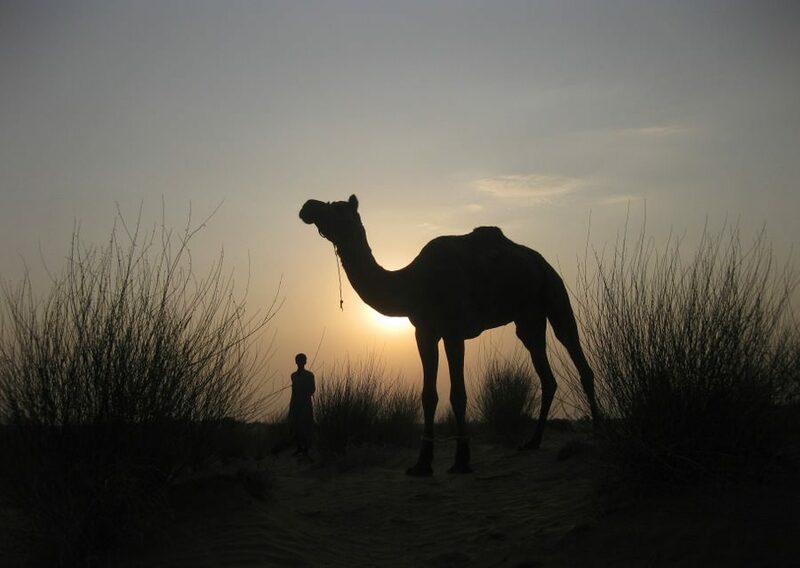 Our camel safari took us as far as the Pakistan border before returning back to Jaisalmer. 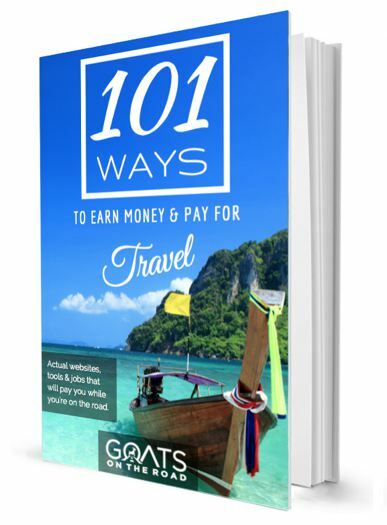 This was one of our top 10 travel experiences for sure! We had been on the island of Sumatra for about a week before deciding to make our way to Lake Toba, which is one of the most interesting lakes in the world. Get this: it’s actually set inside of a volcano and the mountains around the lake are the caldera walls! 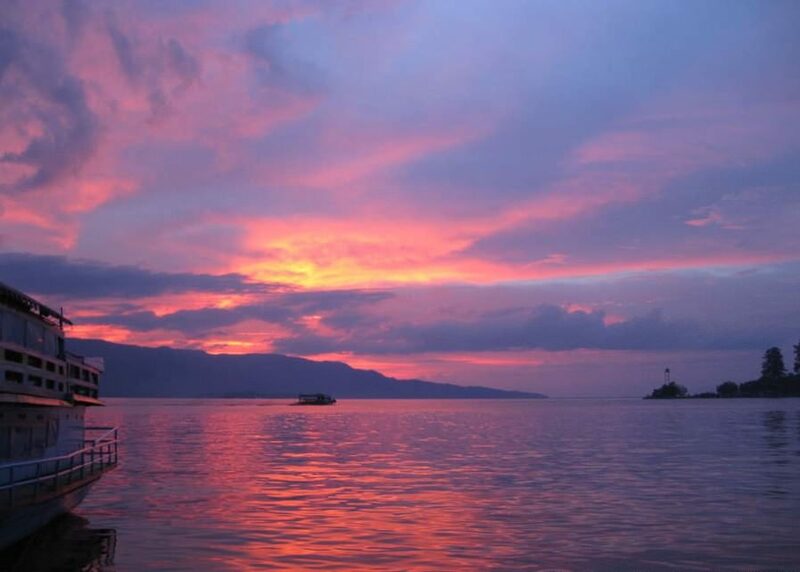 As we were boarding the boat that would take us to Samosir Island in the middle of the lake, this breathtaking sunset appeared. This photo is completely unaltered, the colours were so unbelievable that nothing needed to be changed. Lake Toba was one of the best places we’ve ever visited. This sunset comes from our friend Jacqui over at Roaming Cooking. 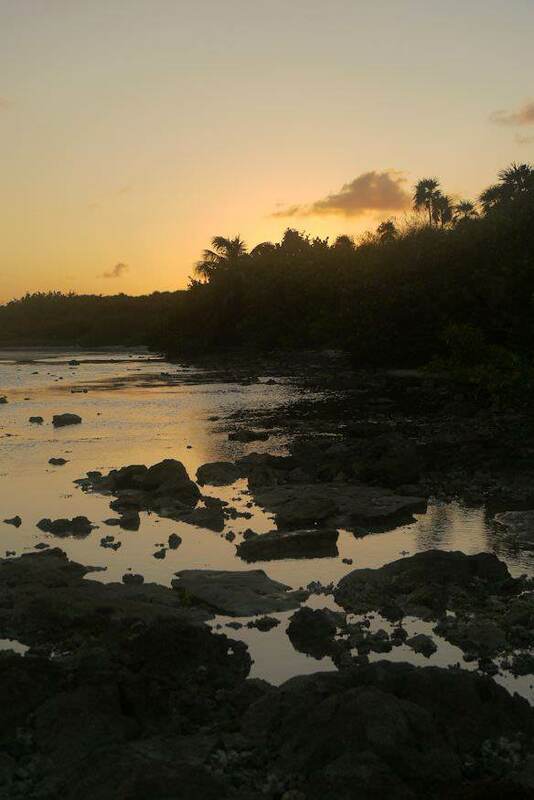 Today’s sunset comes from the lovely Yara of Heart Of A Vagabond. This was another magical sunset taken from a spot about 280 km south of Lisbon, Portugal, at the top of a cliff at a beach called “Praia da Rocha” which means rocky beach. I was traveling through the south with a group of fellow couch surfers and enjoying the very warm winter afternoon, when the sky exploded in shades of red, yellow and orange. This is an untouched photo,which reminded me once again that some of the best things in life are still free. 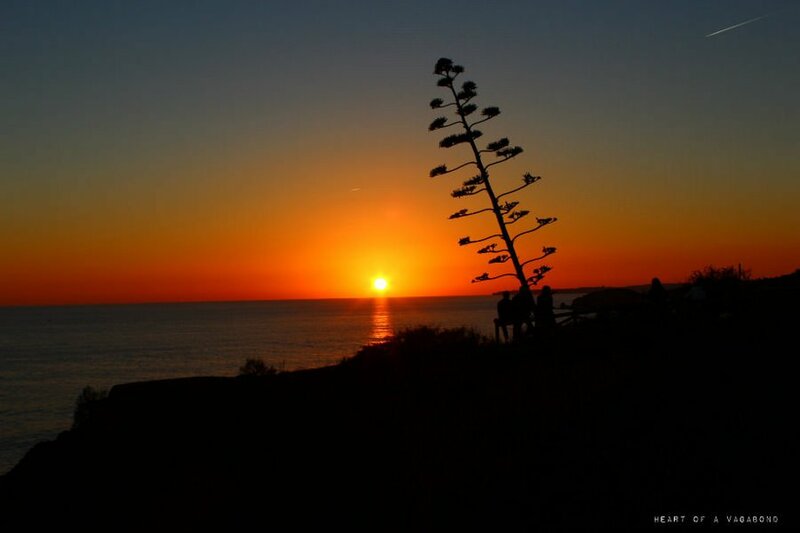 This sunset is from Tarifa, Spain! A huge thank you to Mirna of The Mindful Gypsy for sharing this unfiltered, unaltered photo with us, it’s gorgeous. 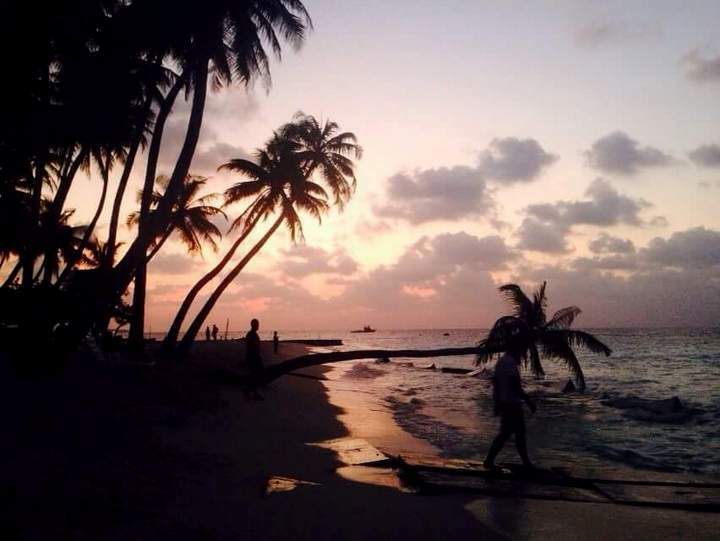 The sunsets in Caye Caulker, Belize are truly stunning! It’s hard to leave this beautiful place. 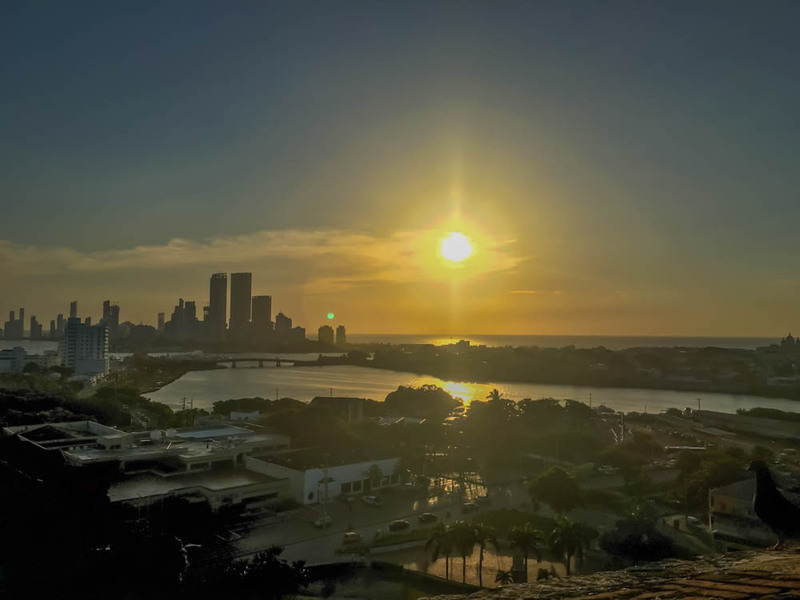 Watching the sun set from atop the Castillo de San Felipe de Barajas in Cartagena. A fort with a view! 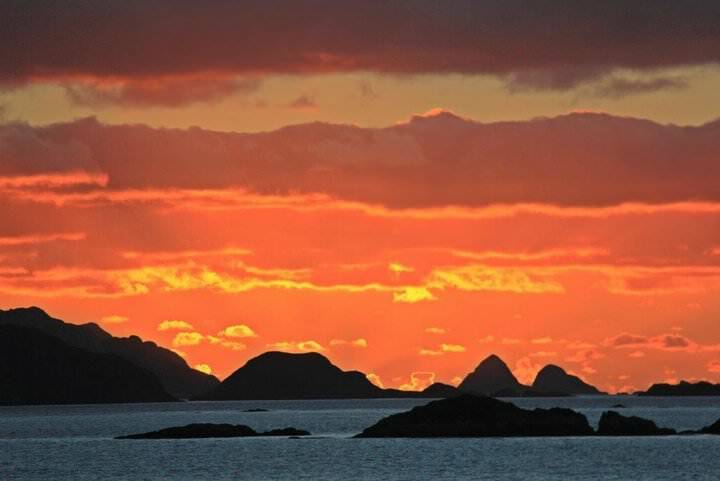 This sunset is from Whangapoua, New Zealand. Thanks to our reader, Deborah Vendrig, for sharing this photo with us. 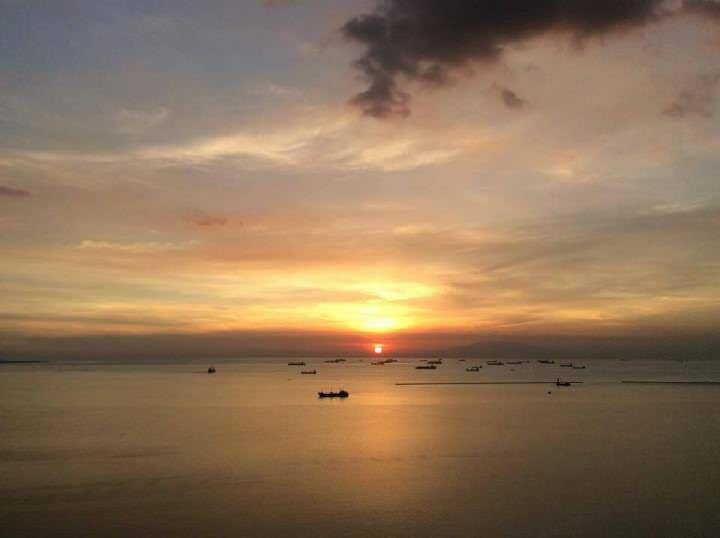 This week’s sunset is from the Philippines! 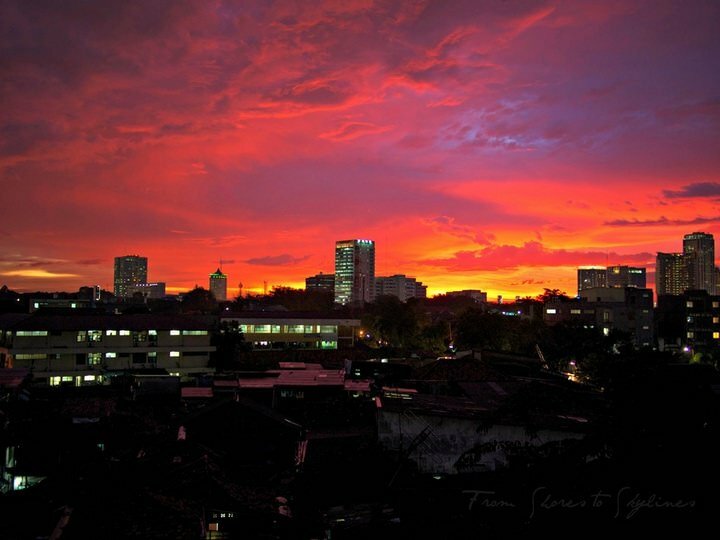 Thank you to our reader Masoud for sharing this beauty from Manila. Thanks to Laura from Savored Journeys for sharing this beautiful shot with us. 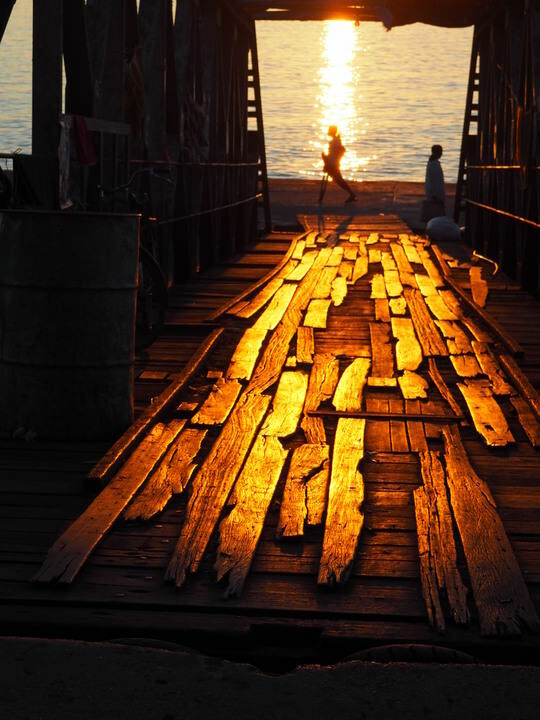 This photo was taken in February 2014 at the waterfront in Moulmein in Lower Myanmar, a small boat pier where people had just stopped working and stopped unloading for the day. We were just amazed by the way the wooden boards looked like gold in the sun. Thanks to Katelijne and Maarten of the travel blog www.chopsticksandtrains.com. This is a lovely photo of surfers hitting the waves in Kuta Lombok in Indonesia. 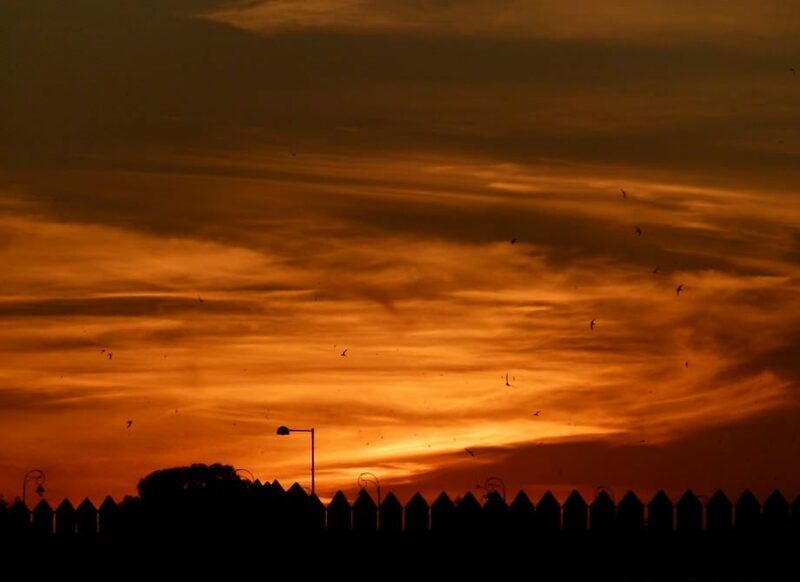 A big thanks to our reader, Alfredo Alfaro, for sending us this awesome sunset! Thanks to our reader and avid traveller, Keri A. Gonzales for sharing this beauty with us! 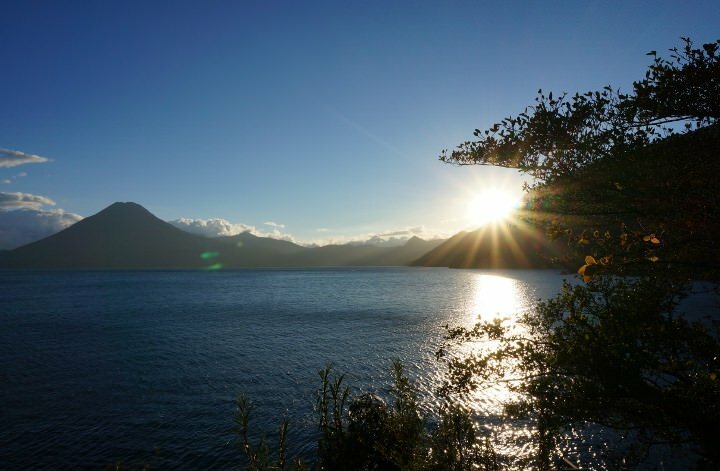 It was taken at Herradura Bay during her backpacking adventure through Central America. 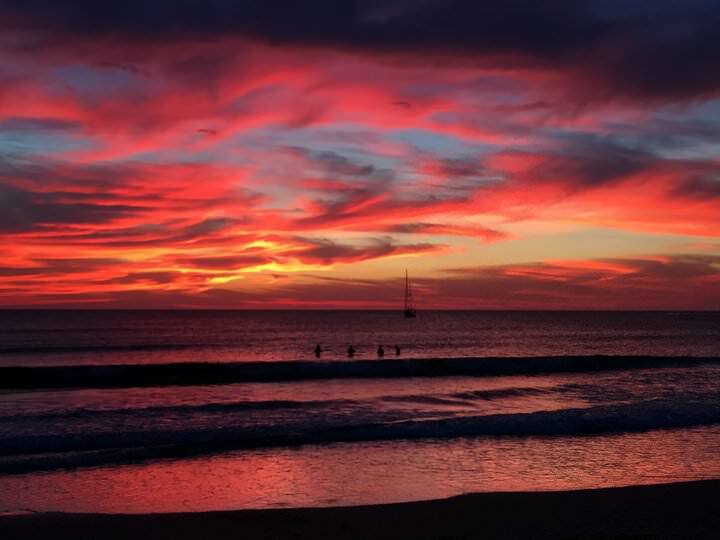 This sunset is from Costa Rica. This sunset is from Maafushi in the Maldives. A gorgeous local (aka BUDGET) Muslim island where everyone is on “island time,” but people will go to the extreme to make your stay as enjoyable as ever. Thank you to our follower and fellow traveller, Amber for sharing this beauty with us! 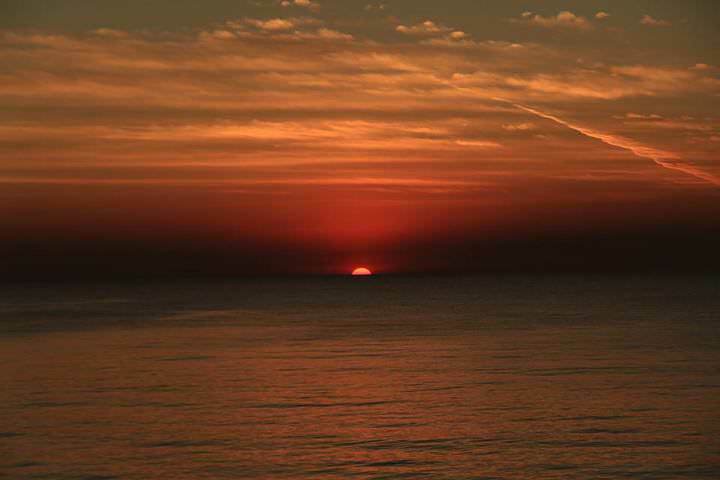 This sunset is from Glenelg, Adelaide in South Australia! 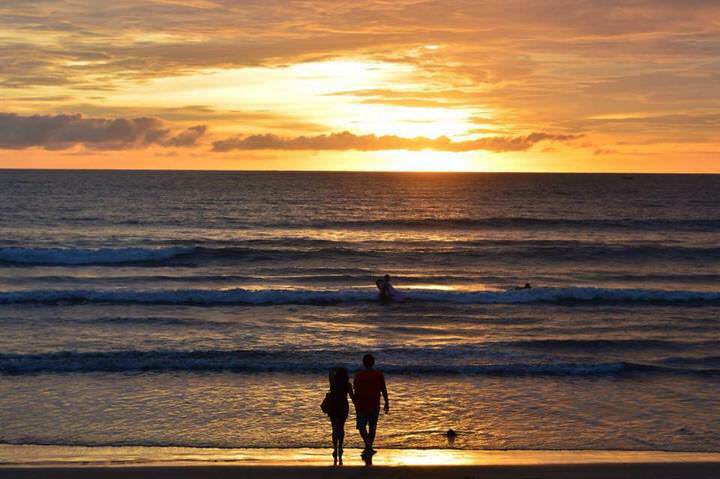 Thank you to fellow blogger and traveller, Christine from The Traveloguer for sharing this gorgeous shot with us. 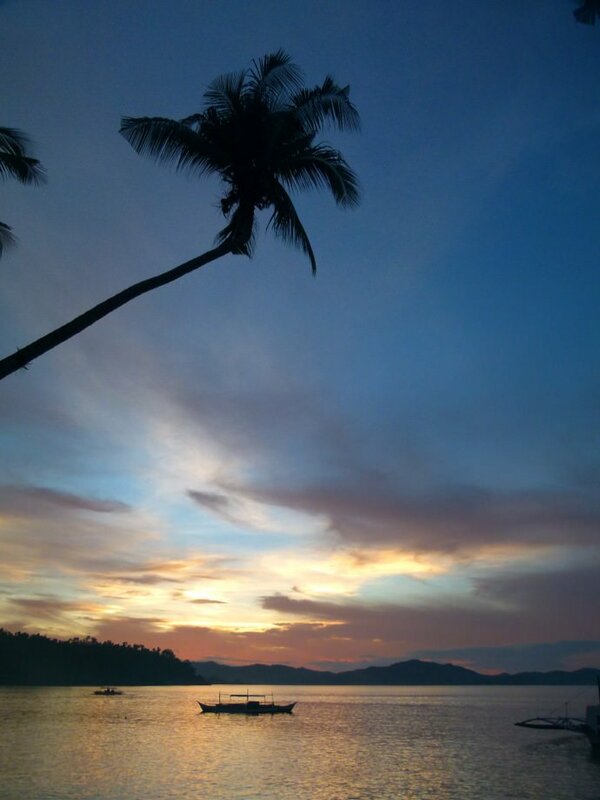 This week’s sunset is from Port Barton on Palawan Island in the Philippines. After a great day of snorkelling, we decided to enjoy a sun-downer on the beach. The sunset that appeared before us was incredible. 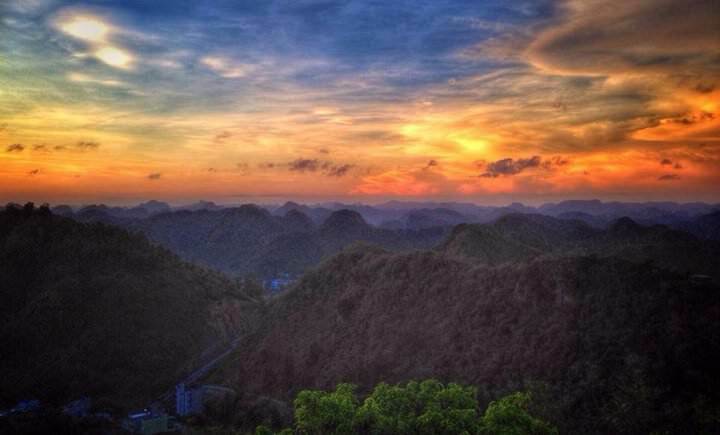 This sunset is from Cat Ba, Vietnam! Thanks to our reader Tim Limon for sharing this photo with us. 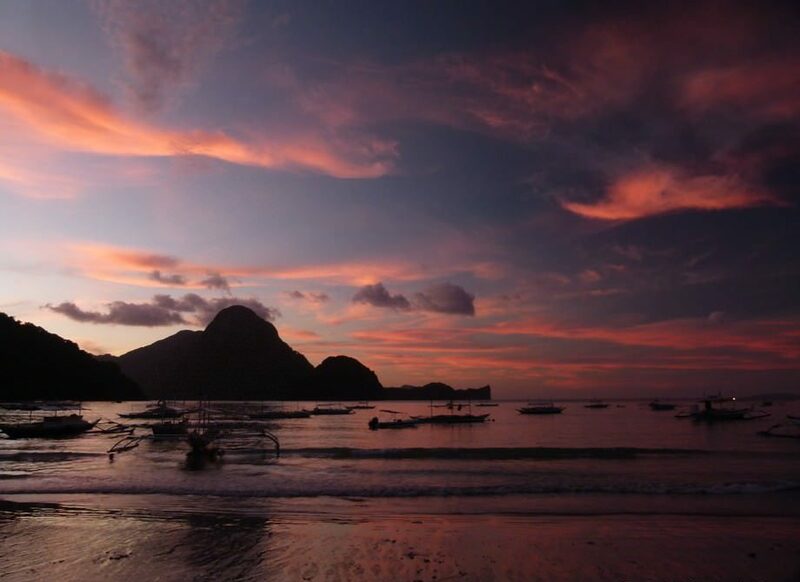 This week’s sunset is from El Nido, Philippines! Thanks to our reader, Maria Cary for sharing this sunset with us. 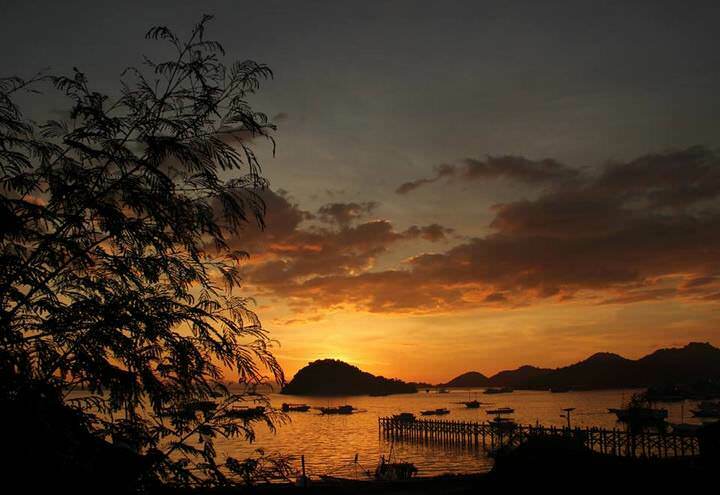 This photo is from Labuan Bajo, Indonesia looking out towards Komodo National Park from my recent trip around the world. Thank you to our reader Brandon Archibald for sharing this gorgeous, golden photo with us! You can follow Brandon’s adventures on Instagram. 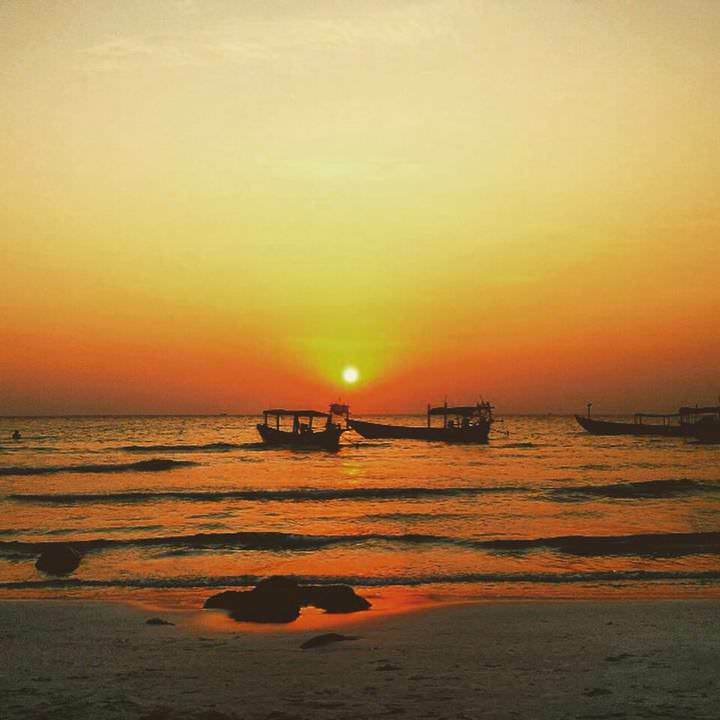 This sunset is from Koh Rong, Cambodia. 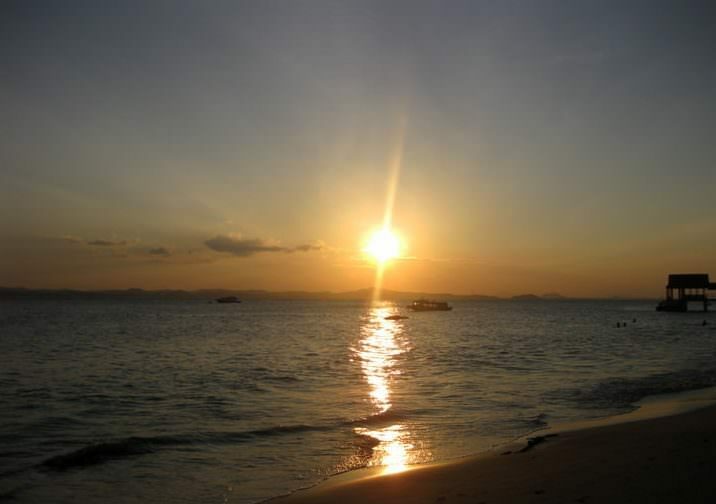 A big thank-you to our reader Bridget Kennedy for sharing this golden beauty with us…we love Koh Rong! Thanks to our friend and fellow backpacker, Merlin Elgner for sharing this golden sunset with us. The picture was taken on the island of Utila in Honduras, you can even see the scuba divers in the water! This sunset is from Australia. Thanks to our reader Beth Ko for sharing this lovely shot. 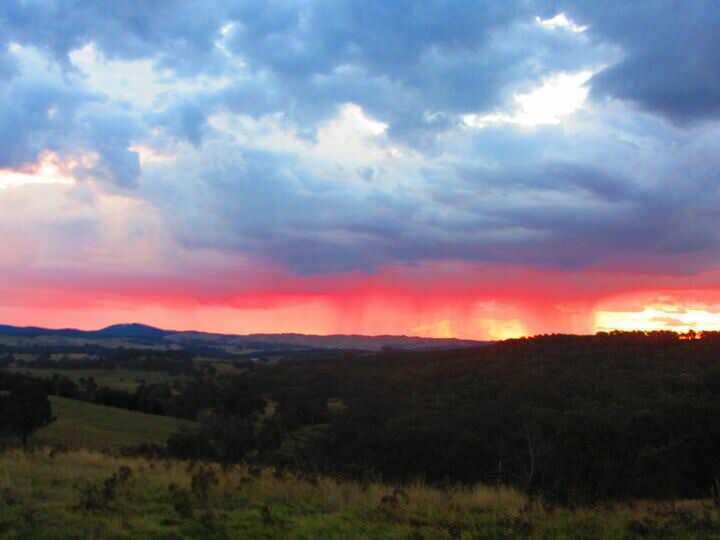 The sunset was taken in rural New South Wales, Australia, check out the rain in the distance! I know I titled this article 101 Sunset Quotes & Photos, but why start there? We have a few more sunset quotes and photos to share with you so here it goes! 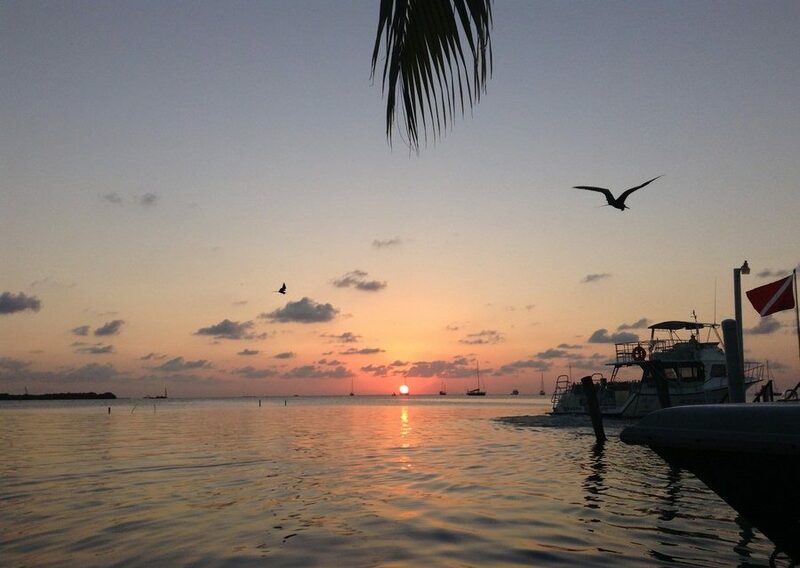 This sunset is from Isla Mujeres, Mexico. We were so thrilled to be on the Caribbean side of Mexico and loved our time there. The sunsets were lovely, the sand was powdery white and the water was crystal clear. This was the first sunset we had seen since our time spent in San Pancho, what a beauty! 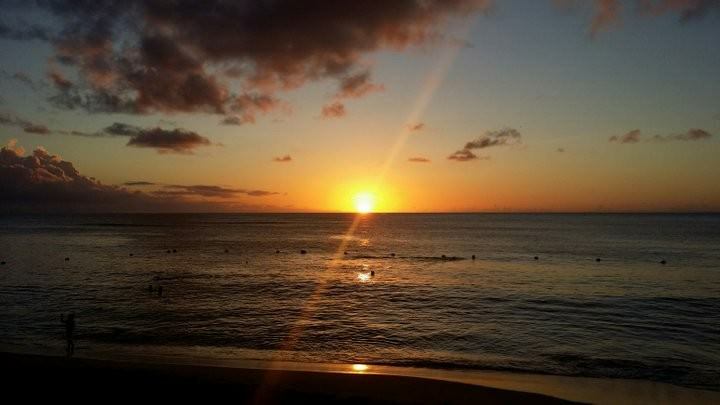 This sunset is from Jamaica. 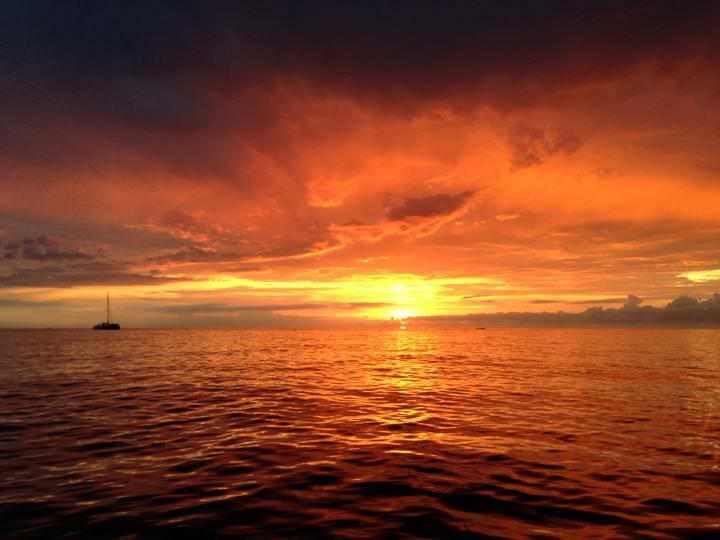 This was taken on a sunset catamaran trip to Rick’s Cafe and a bunch of caves in Negril, Jamaica. Most definitely the most magnificent sunset I’ve ever seen and will be hard to top. It reached across the whole sky! Unfortunately all I had on me was my iPhone camera but boy, it did a pretty good job of capturing it. Thanks to Luke from AntiTravelGuides.com for sharing this beauty with us! 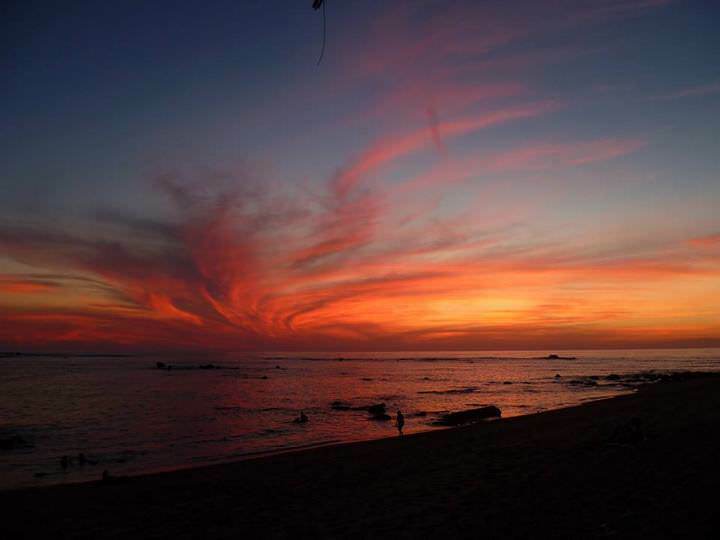 This sunset is from Punta de Mita, Mexico. After hitchhiking from San Pancho, in the box of a pick-up truck, we arrived at the little town of Punta de Mita. 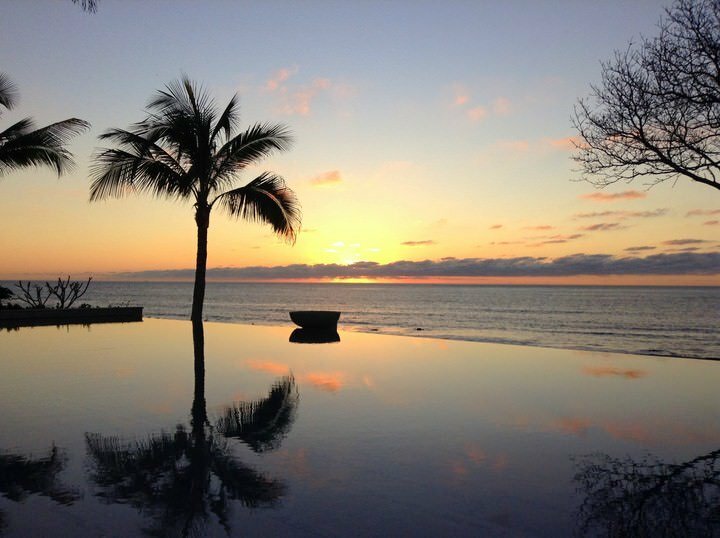 At the end of the day, the sun was setting over the Pacific Ocean, creating an incredible reflection on the infinity pool. The shadows of the palm trees and the colourful clouds made for a great photo. It was the perfect end to a great day of visiting with loved ones. 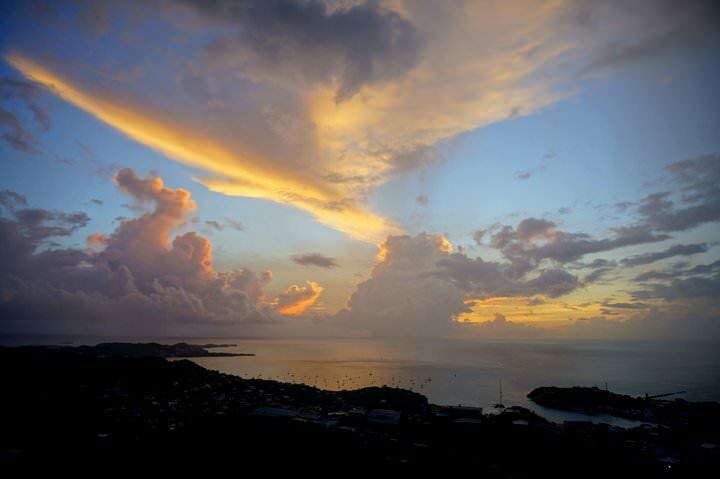 As you know, we have many favourite sunset watching spots here on the Caribbean island of Grenada. Recently we went to a really chilled out, popular bar/marina called Prickly Bay. 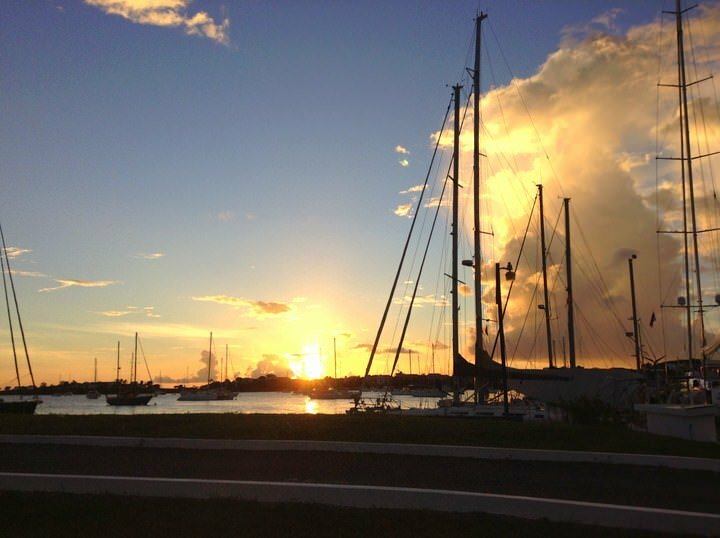 As we were enjoying a massive glass of red wine, the sun was setting behind the many sailboats and yachts. It was the perfect view for enjoying our drinks. 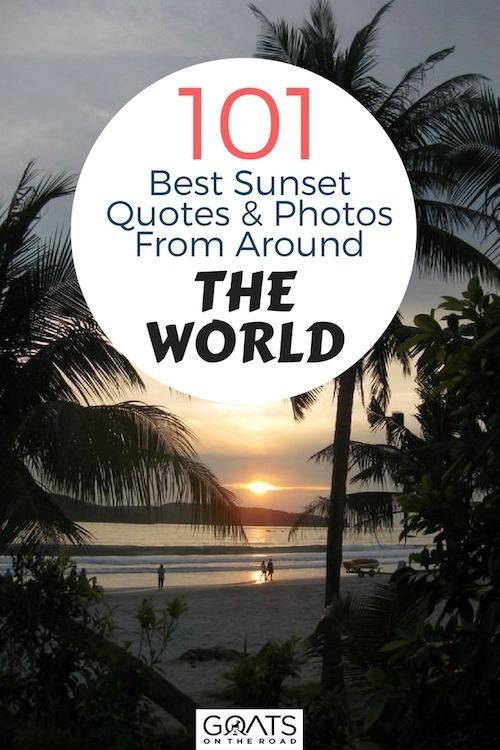 I really hope you enjoyed this LONG post of our favourite sunset quotes and our best sunset photos from around the world. I really have to thank all of the bloggers and travellers who took part in this post and allowed us to share their amazing photography on our blog. If you have a favourite sunset quote, or a favourite travel quote in general, please feel free to scroll down and share it in the comments section below! If you can find a sunset quote that we haven’t thought of, we may be able to include it in the list! Thanks as always for reading. Now turn off your device and go watch a sunset! Nice collection of Sunset Quotes for travellers.